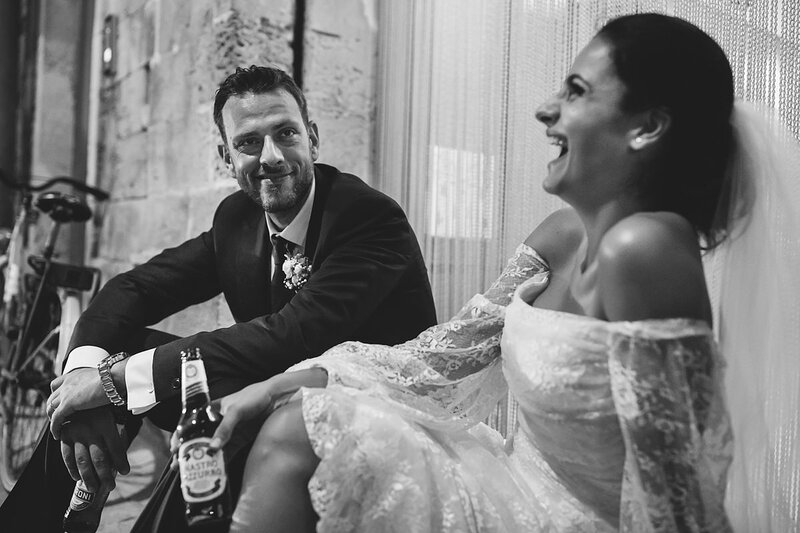 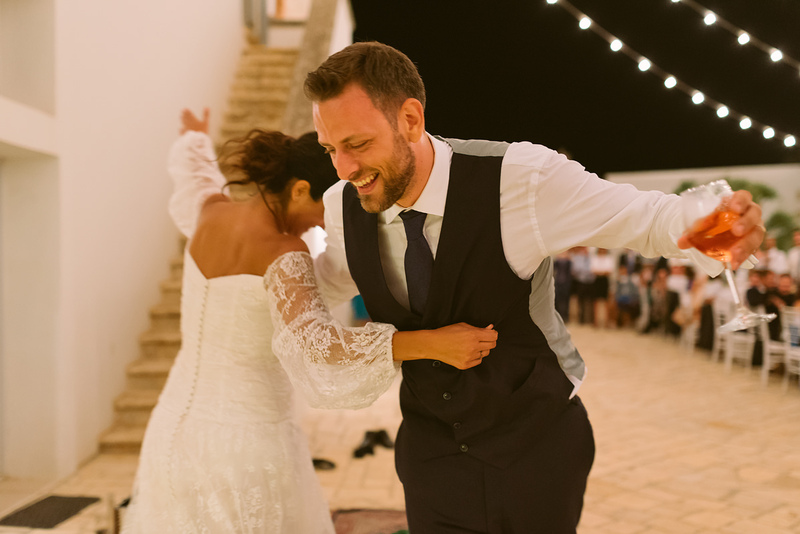 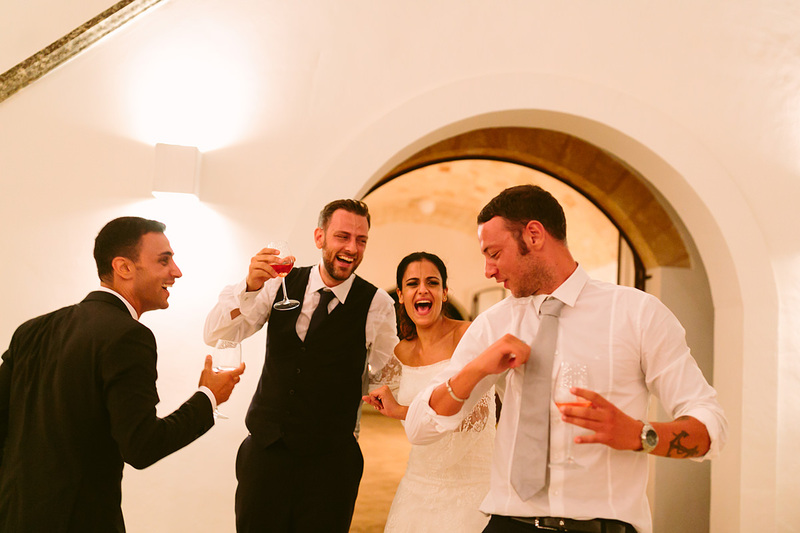 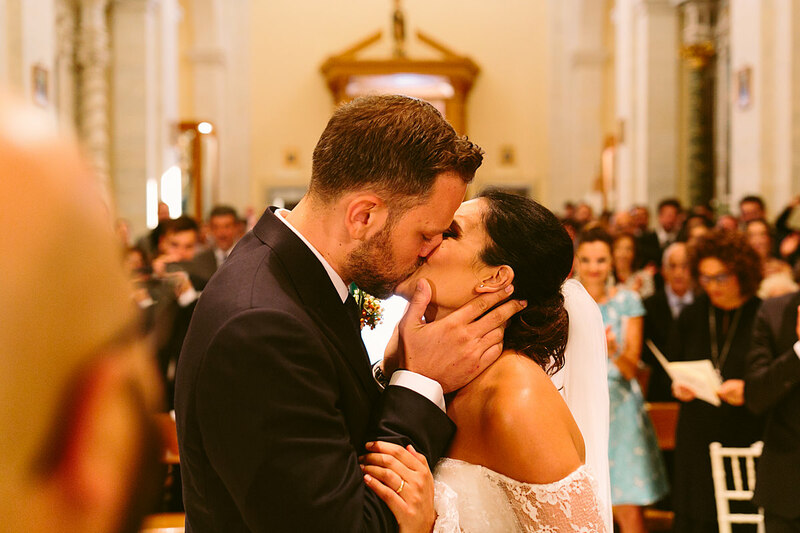 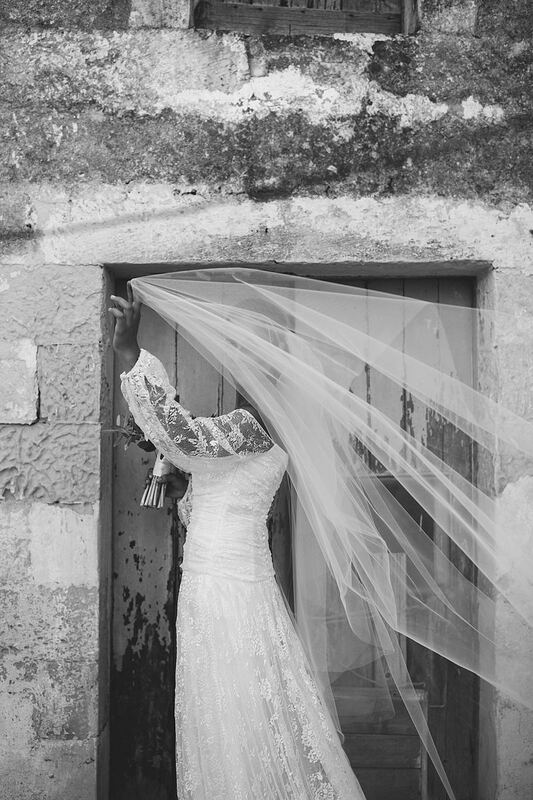 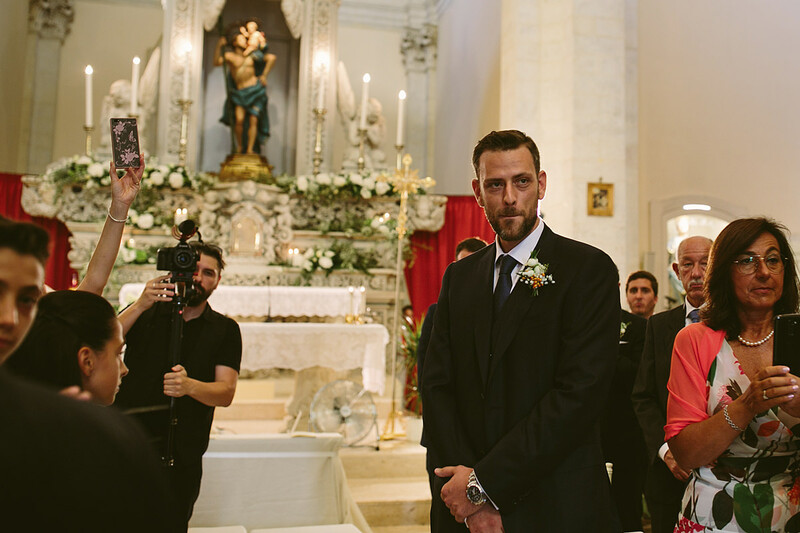 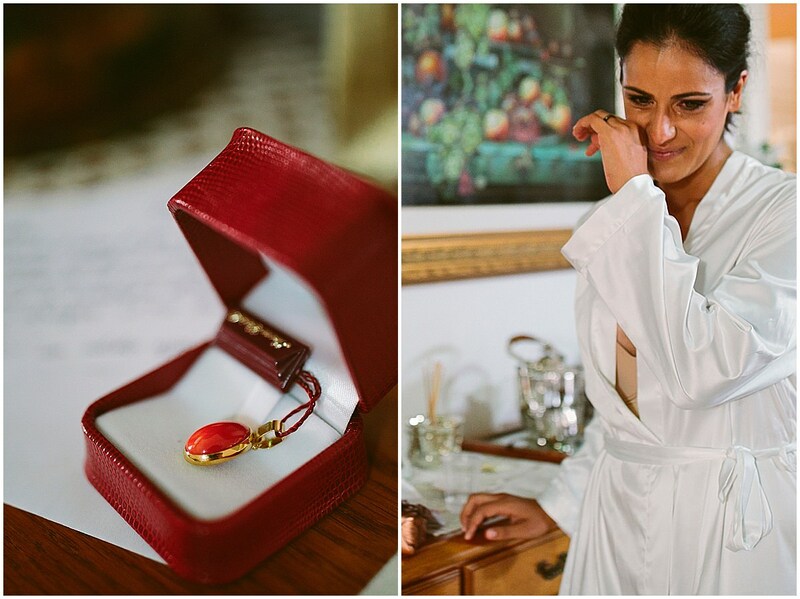 This event was very special for me, I felt extremely honoured to be Roberta and Valerio’s wedding photographer in Puglia . 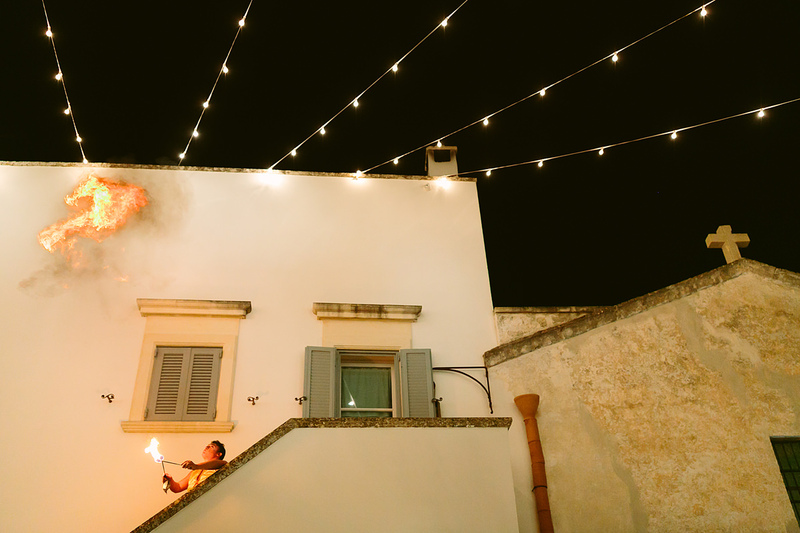 I love Apulia. 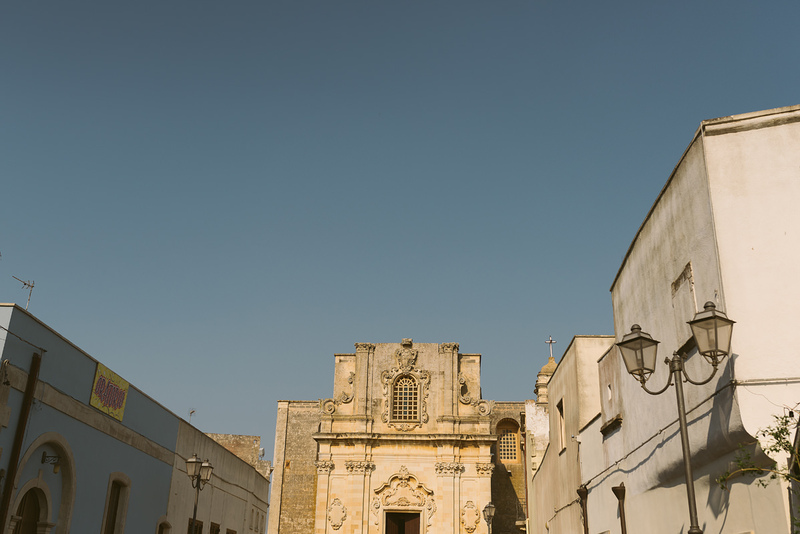 Though it is the ‘heel of Italy’, Apulia holds so much of its heart and beauty. 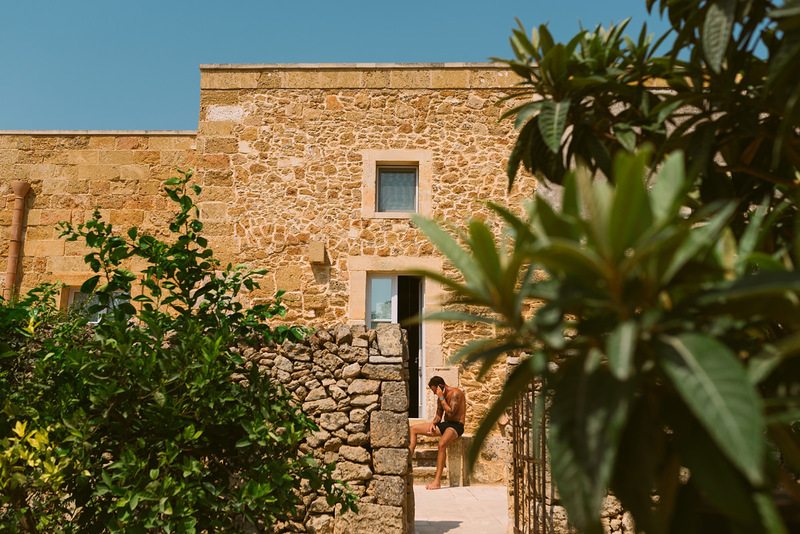 Set by the sea, the area is rich with folklore, old tradition, homemade and homegrown food, picturesque beaches, and charming old towns. 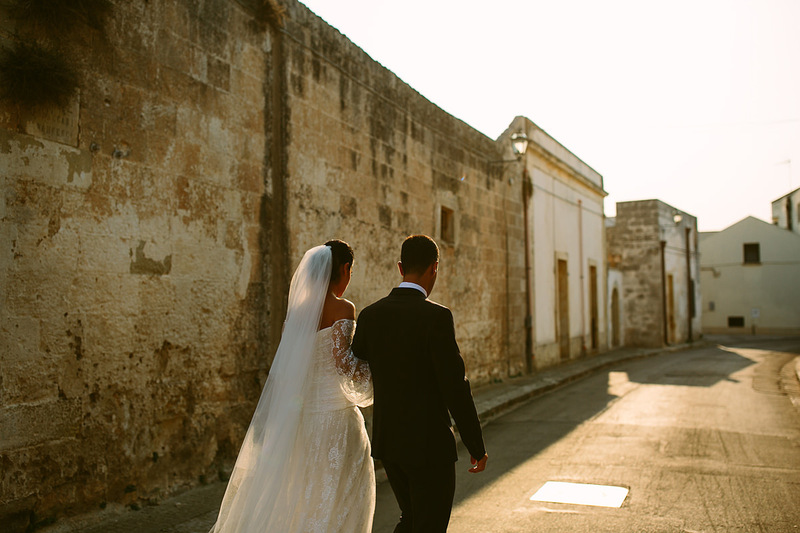 Apulia is also the home to the beautiful white Trulli, and the stunning “White City” Ostuni. 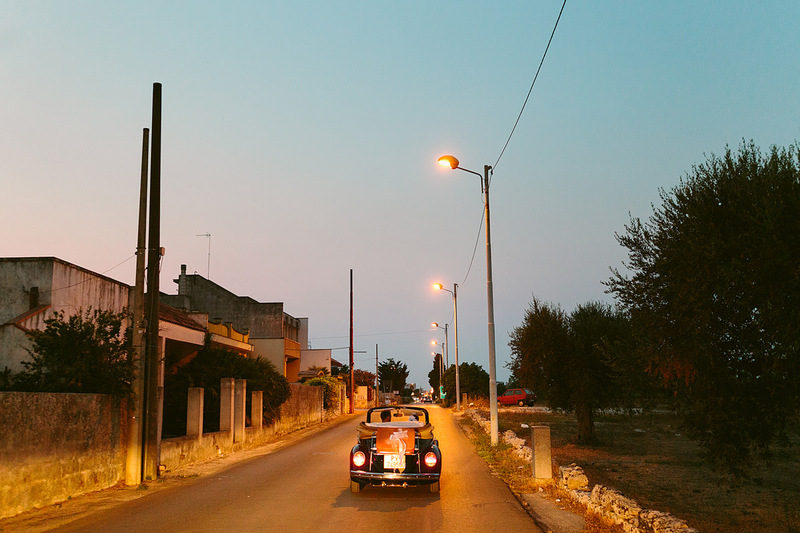 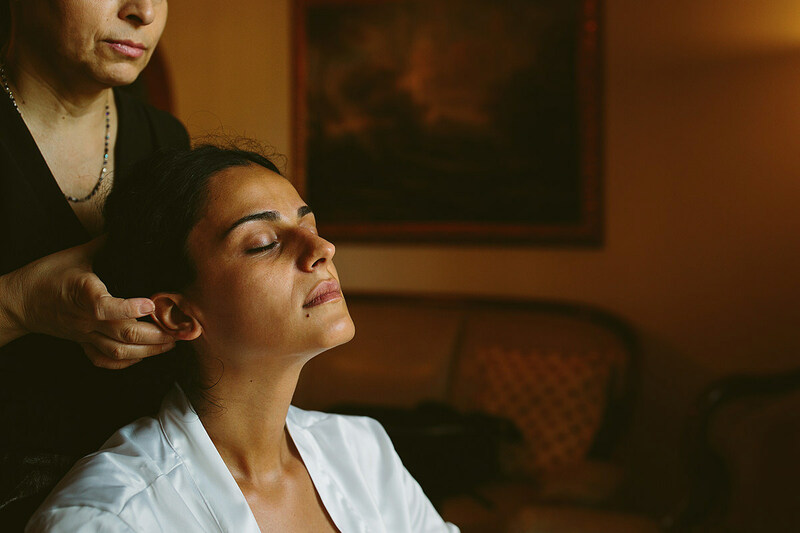 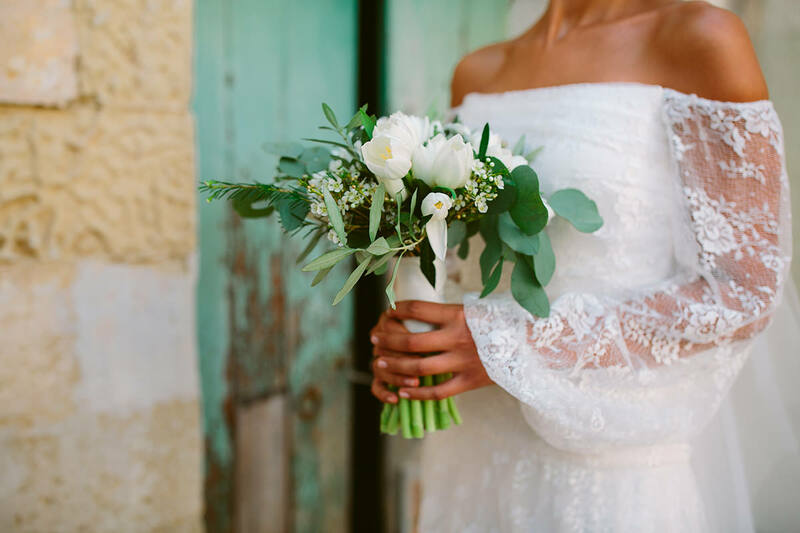 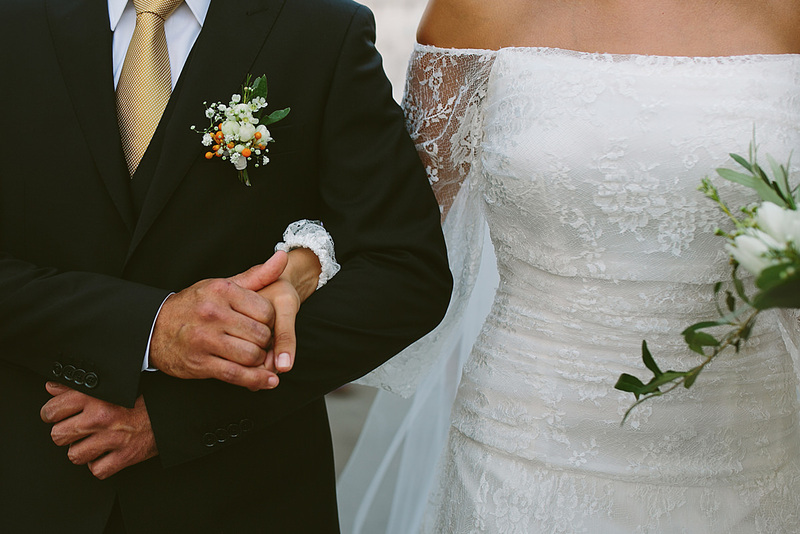 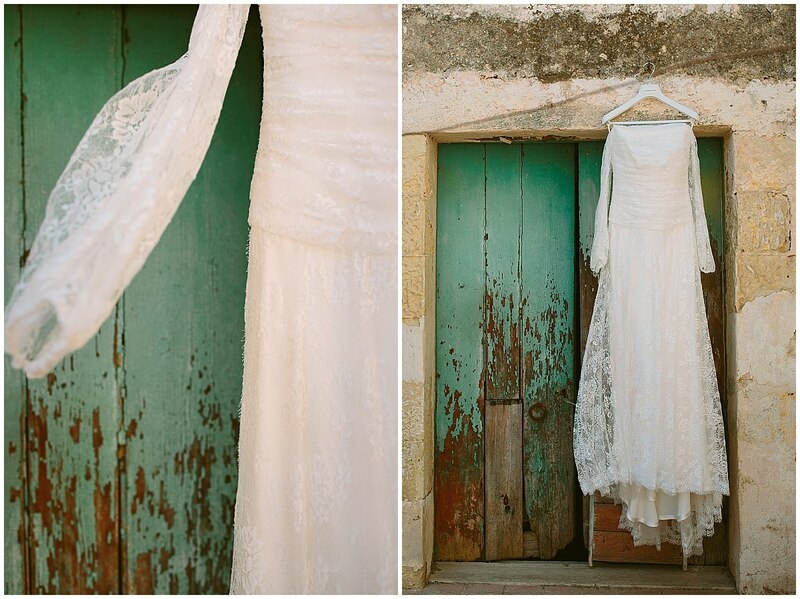 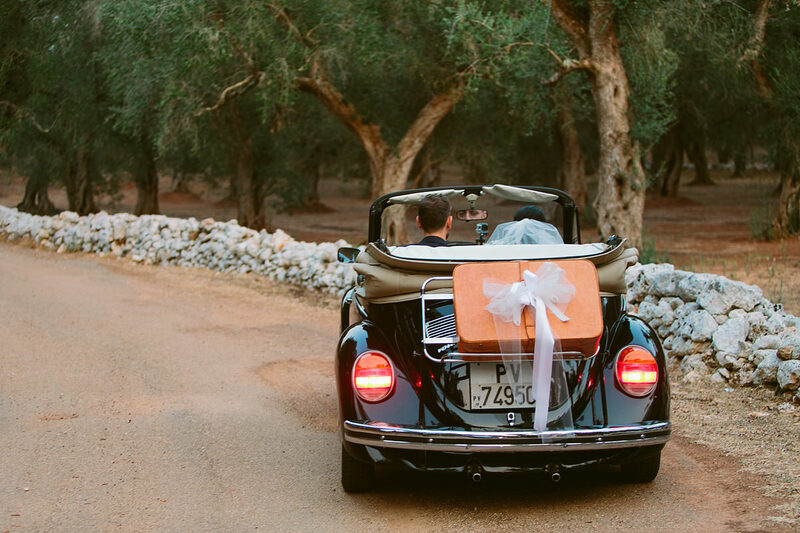 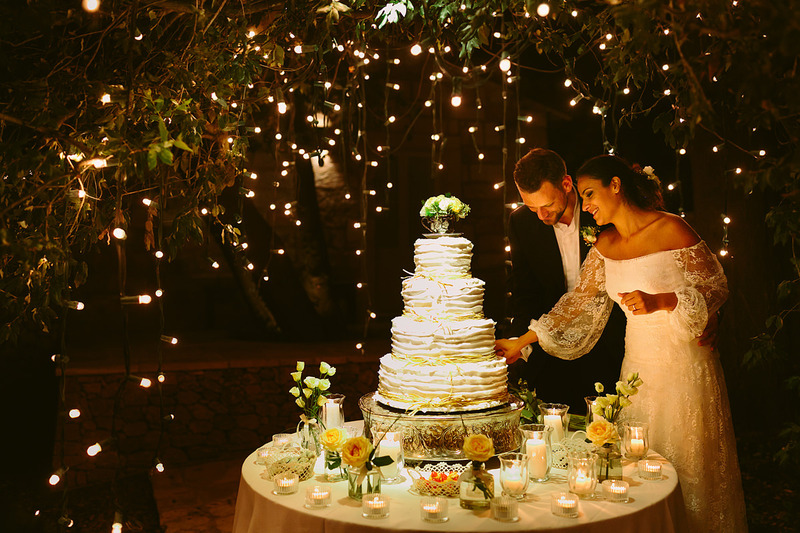 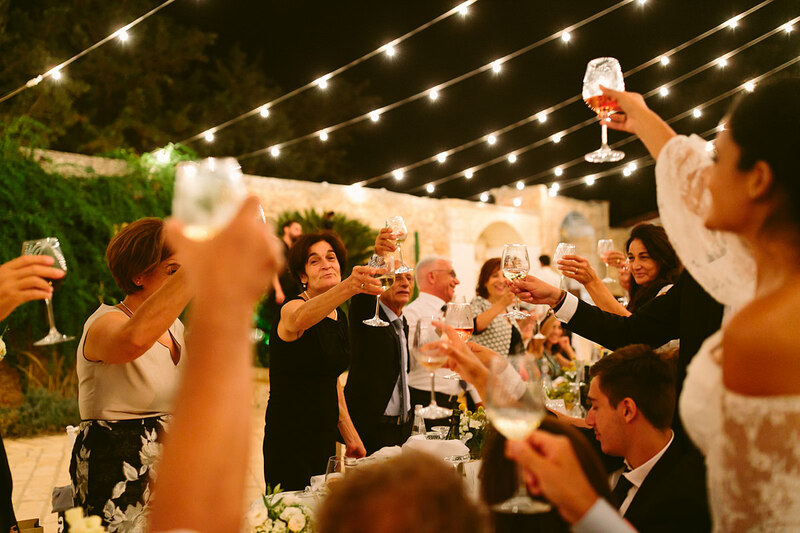 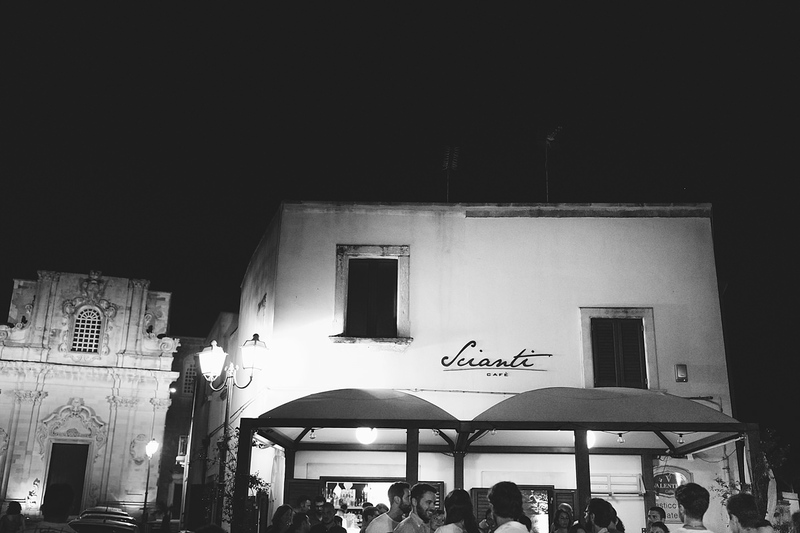 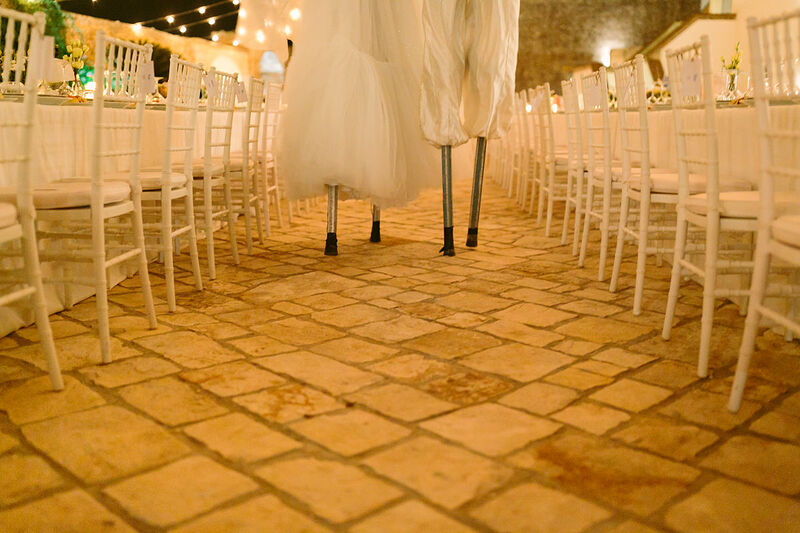 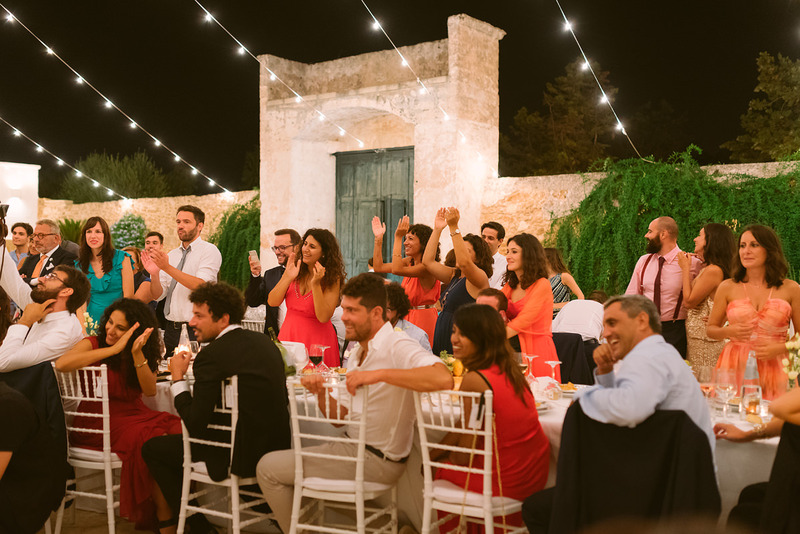 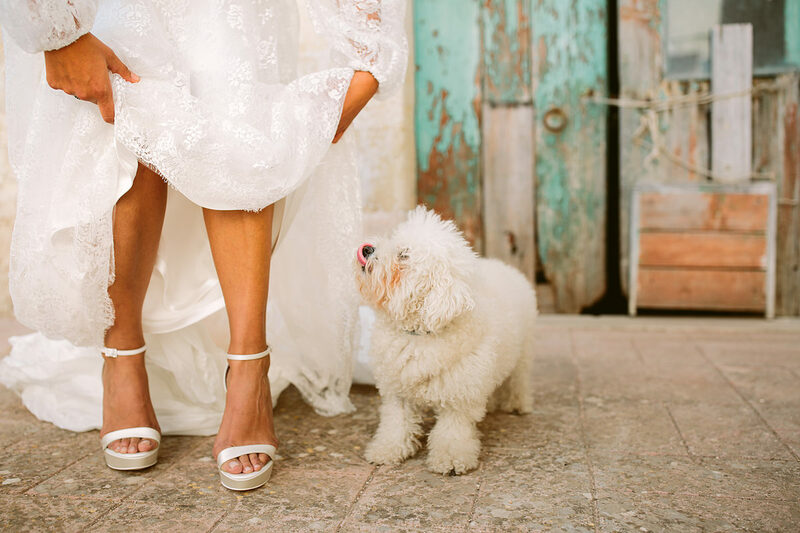 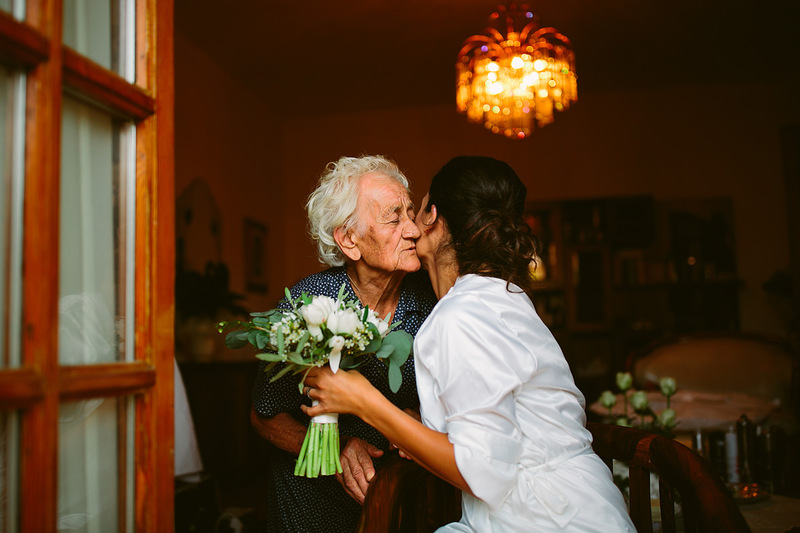 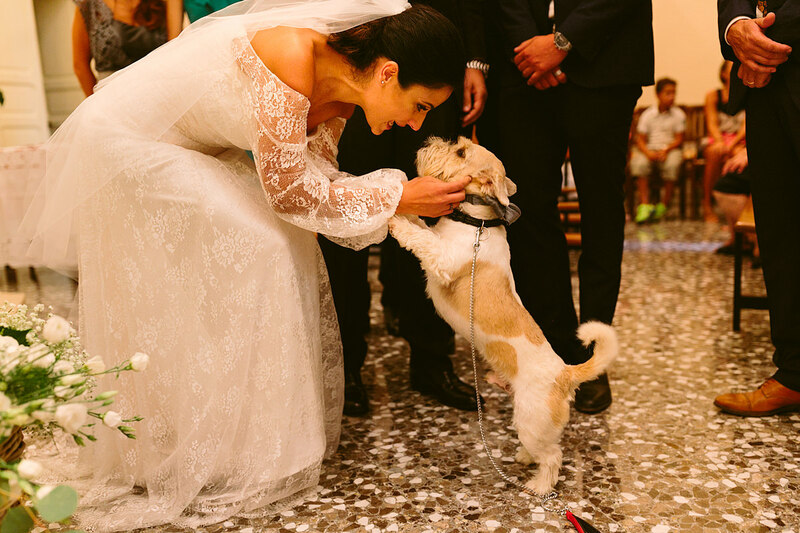 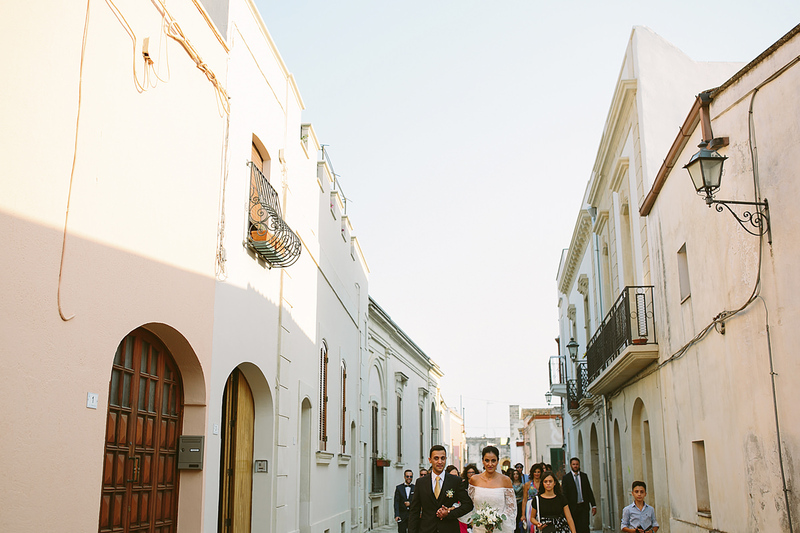 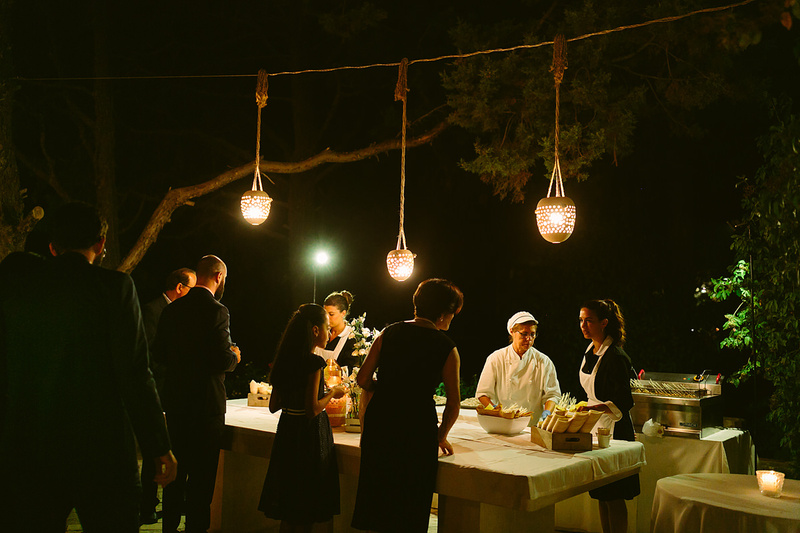 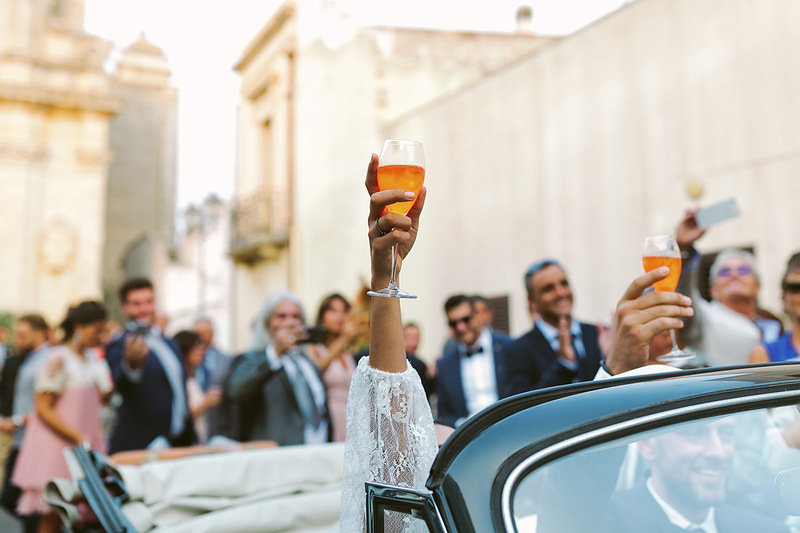 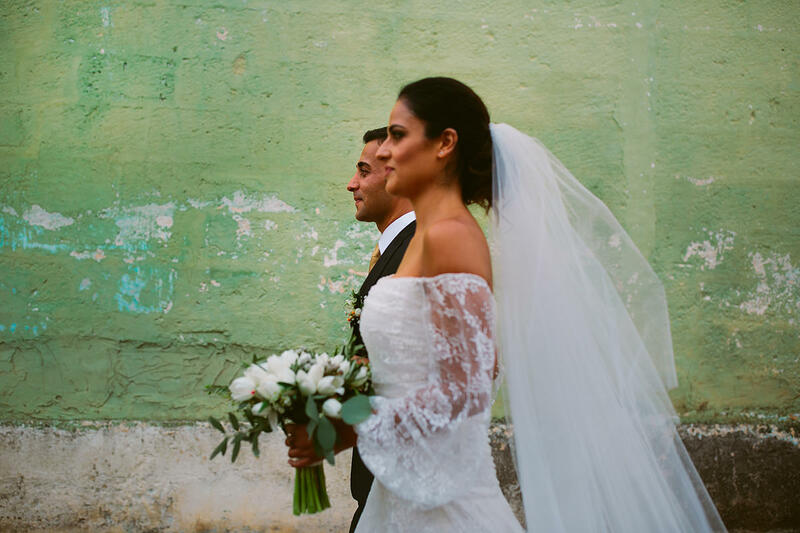 The very little tourism and commercialism, beautiful sights, and warm Italian culture, makes Apulia an incredibly italian rustic chic wedding location. 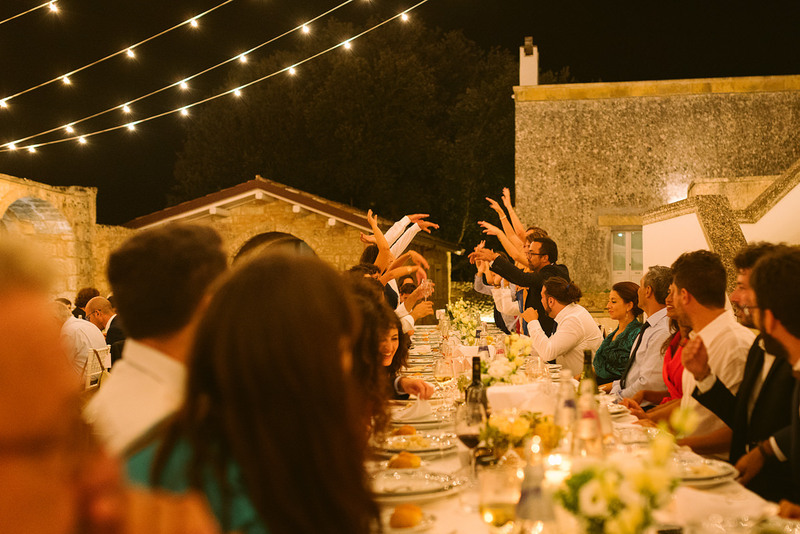 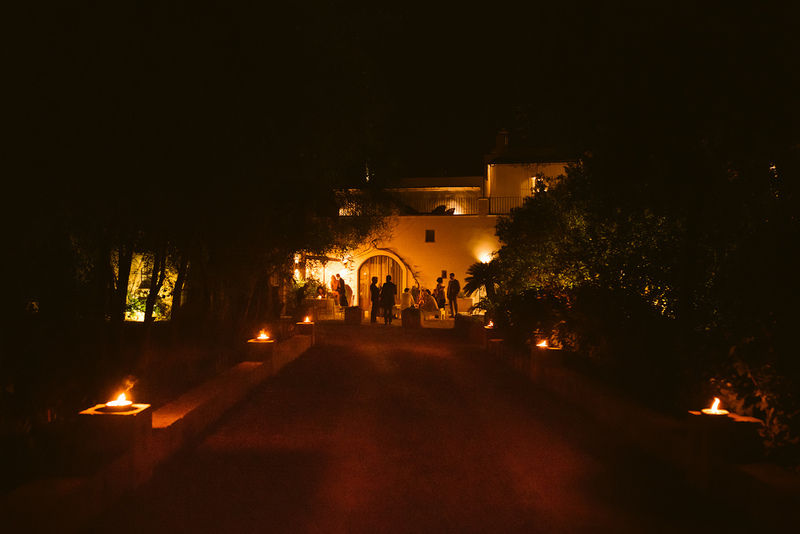 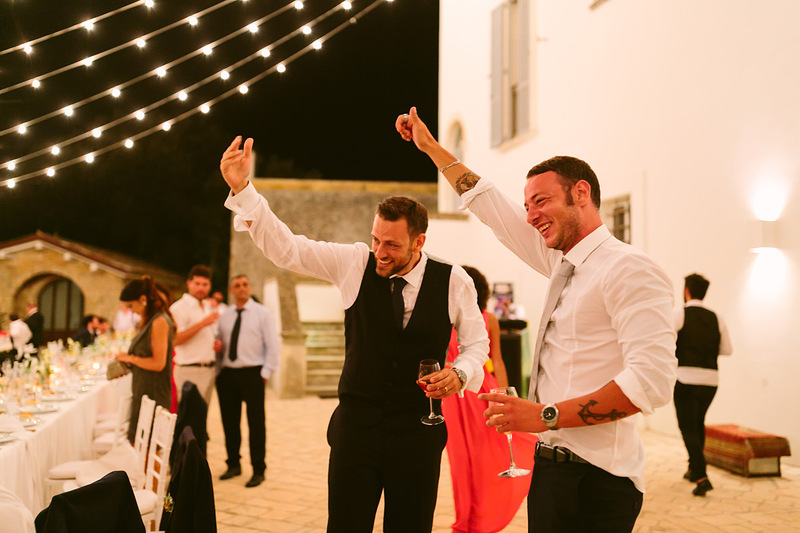 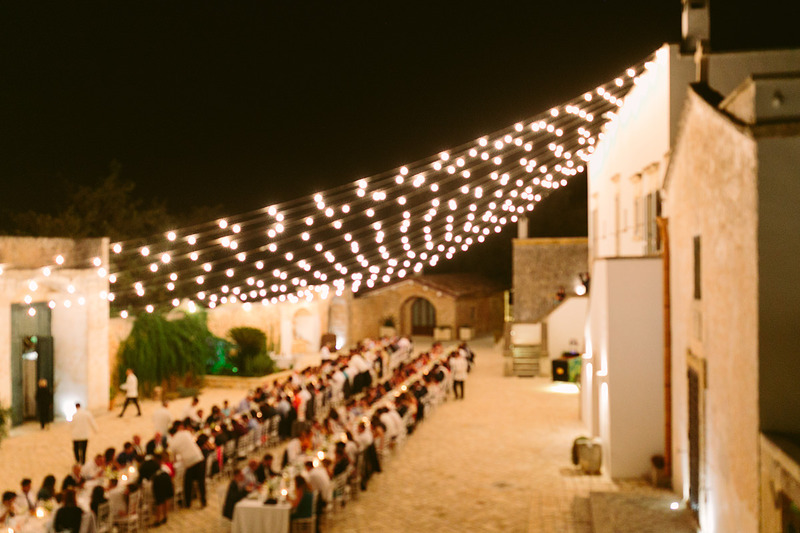 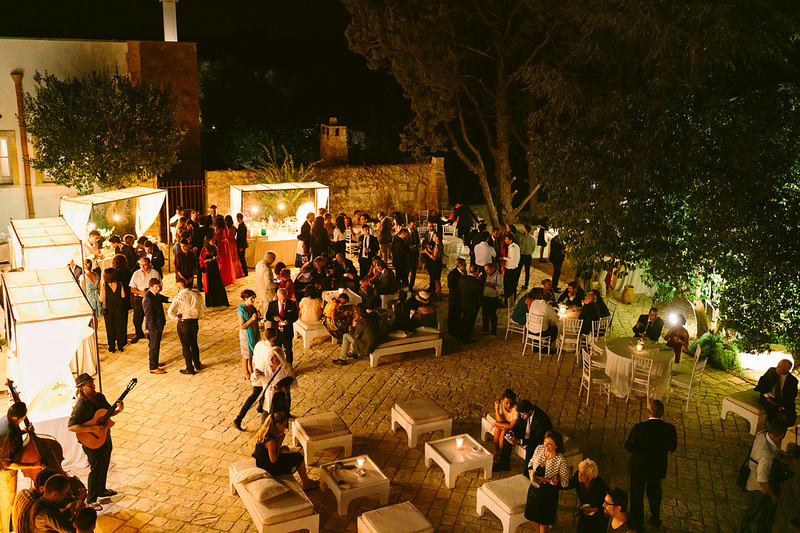 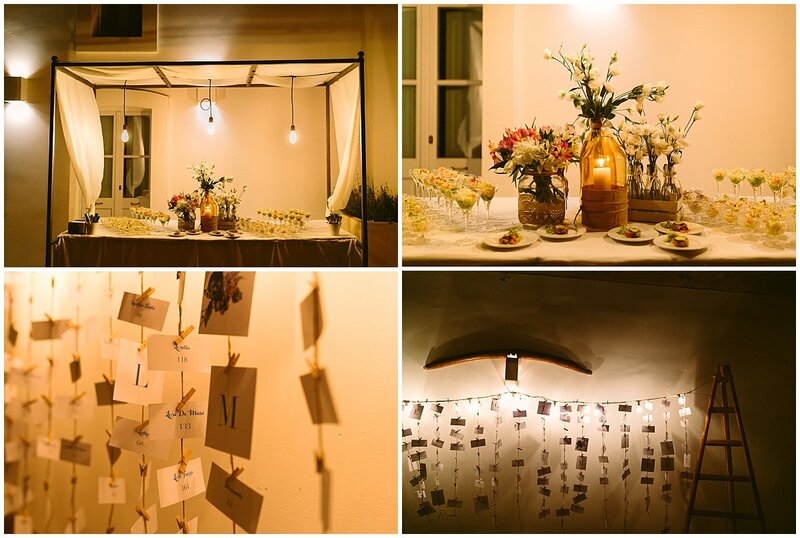 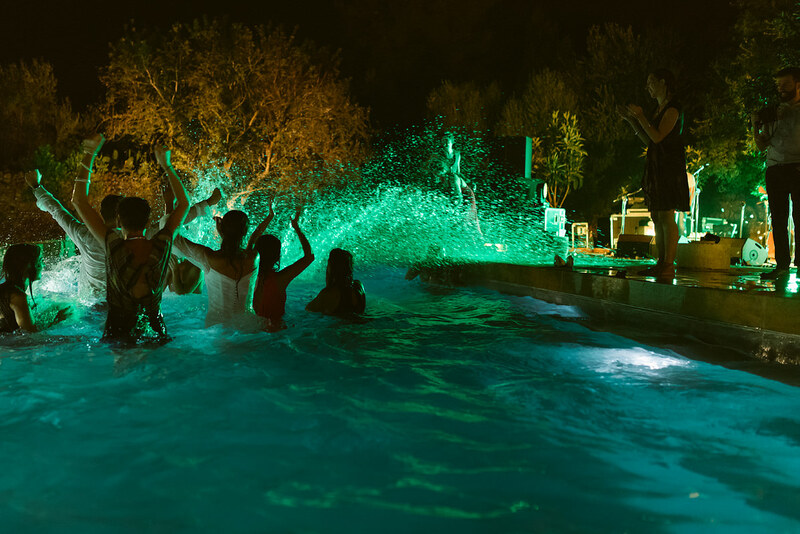 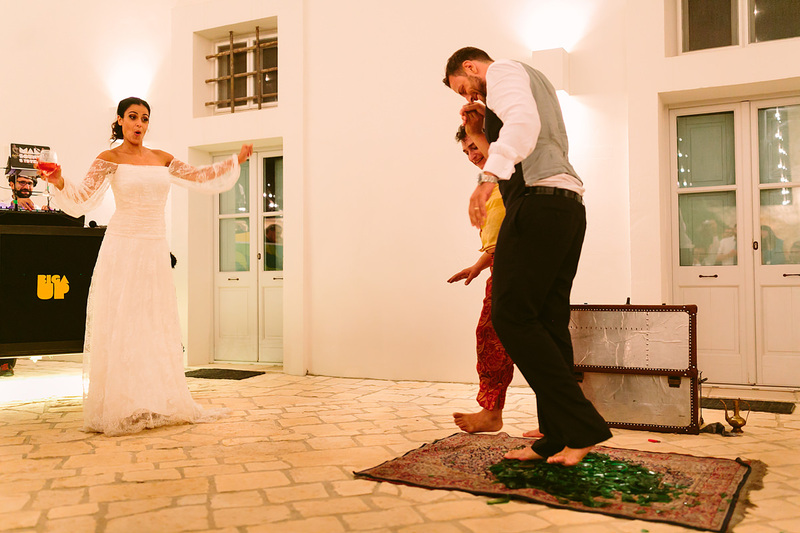 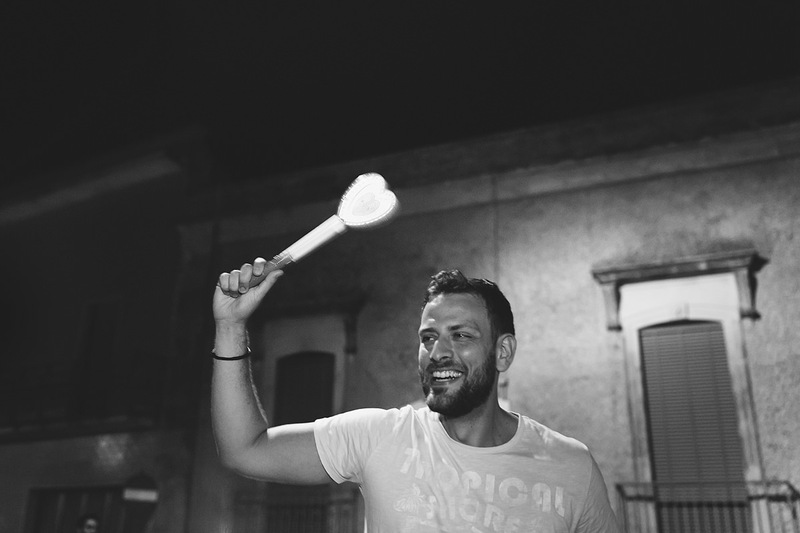 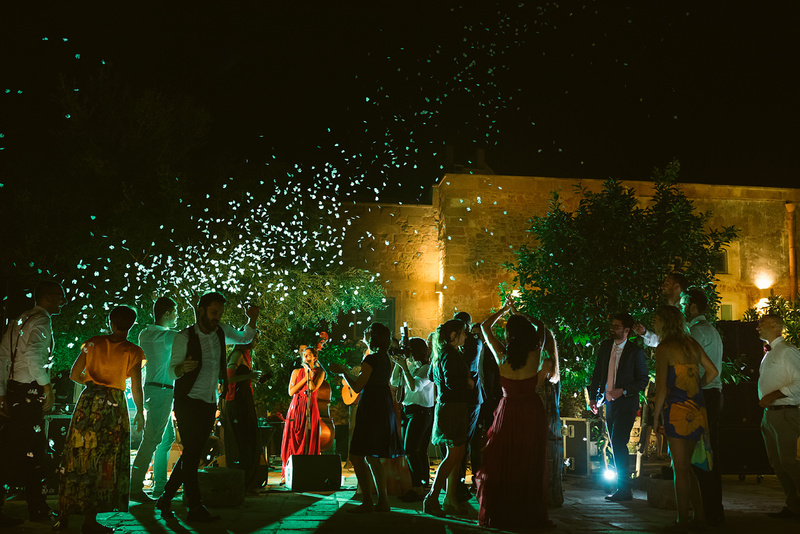 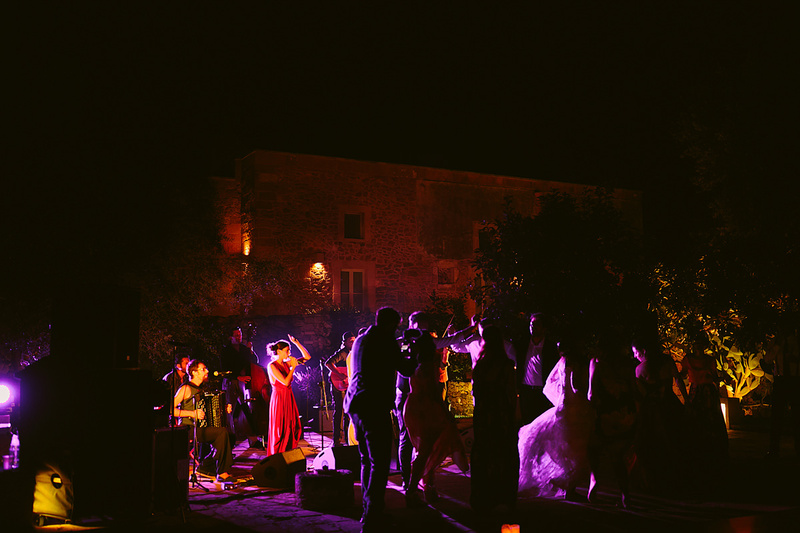 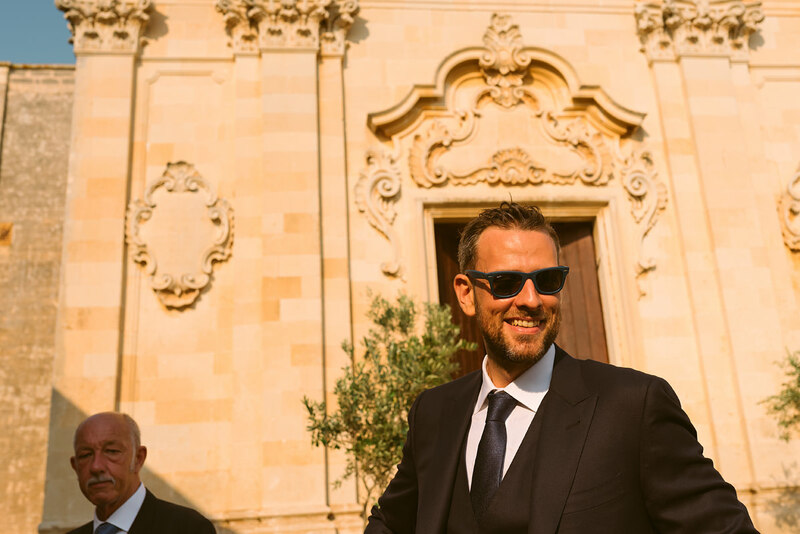 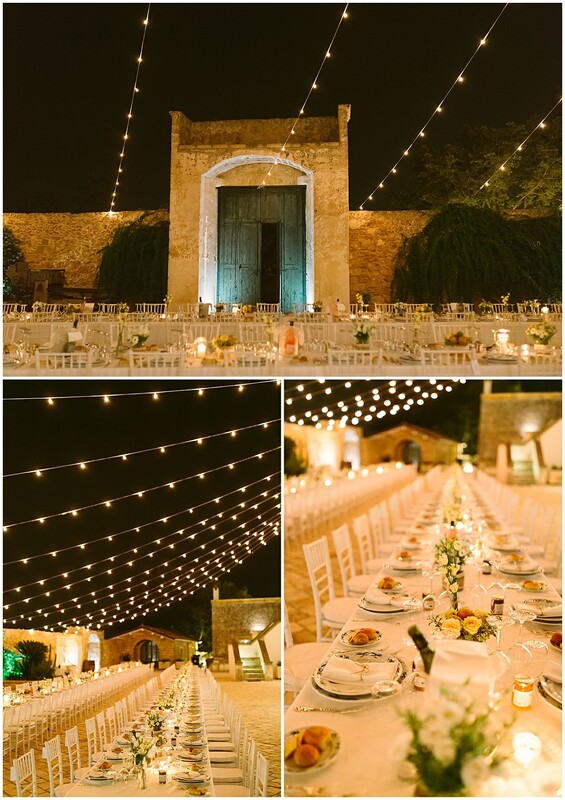 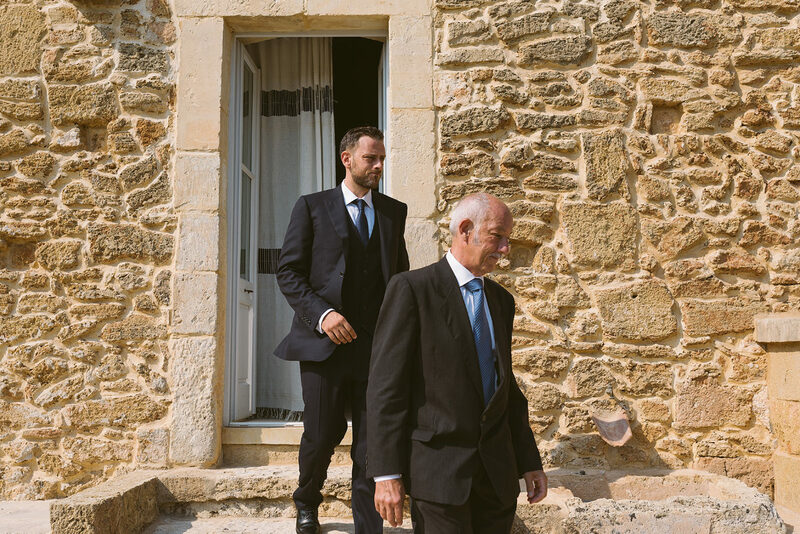 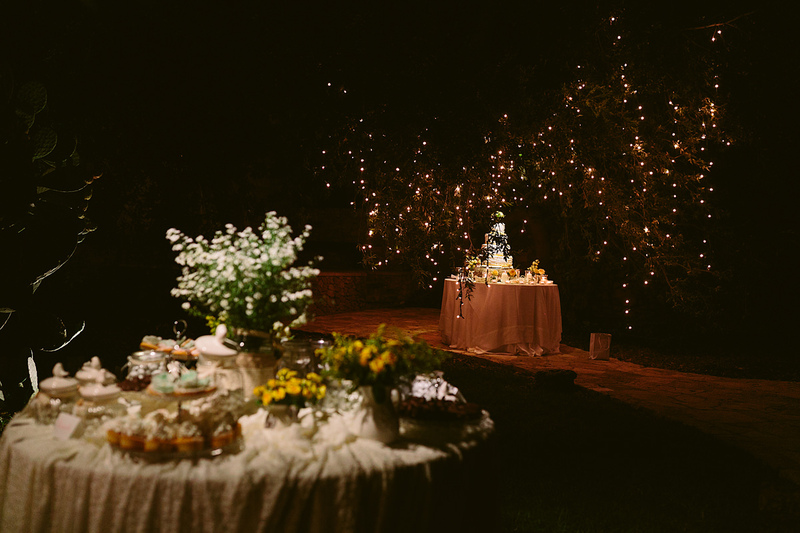 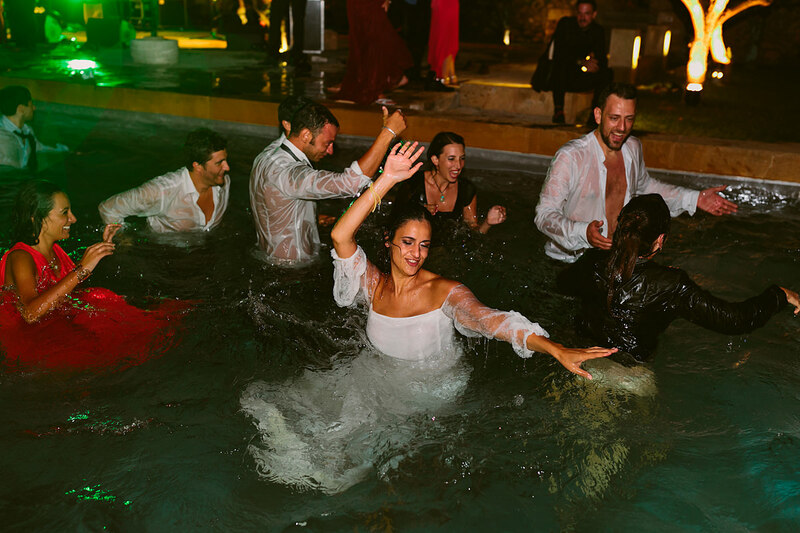 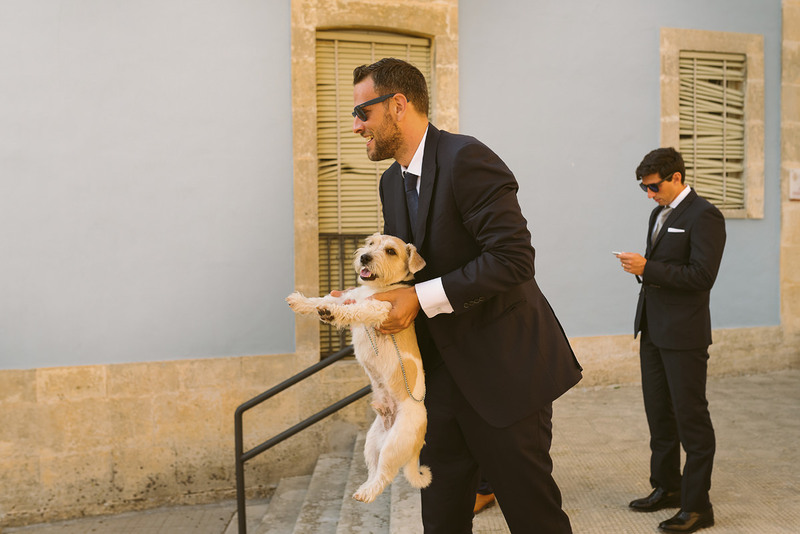 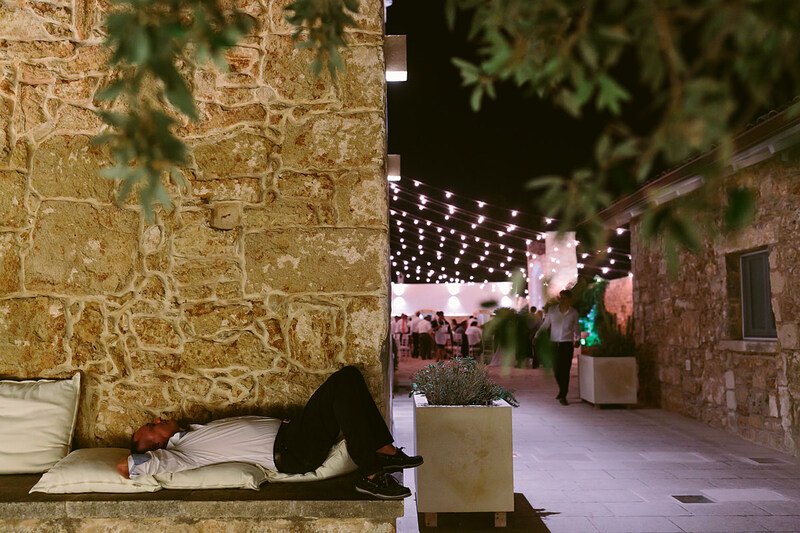 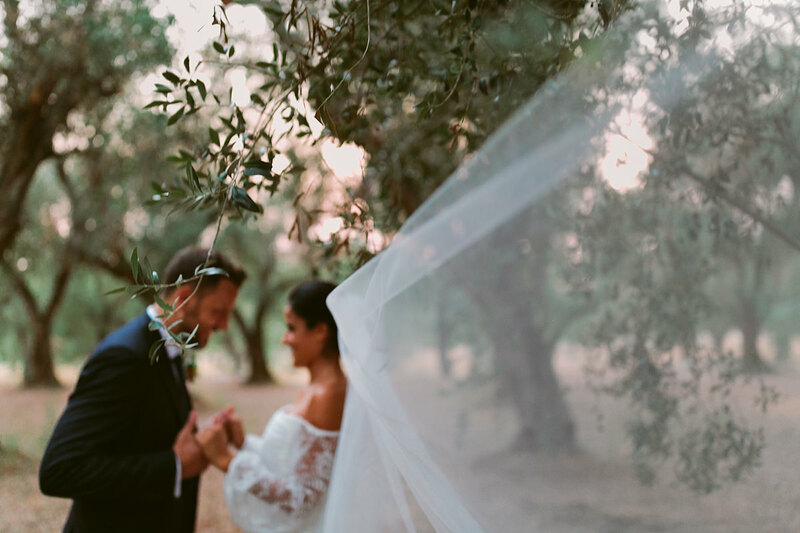 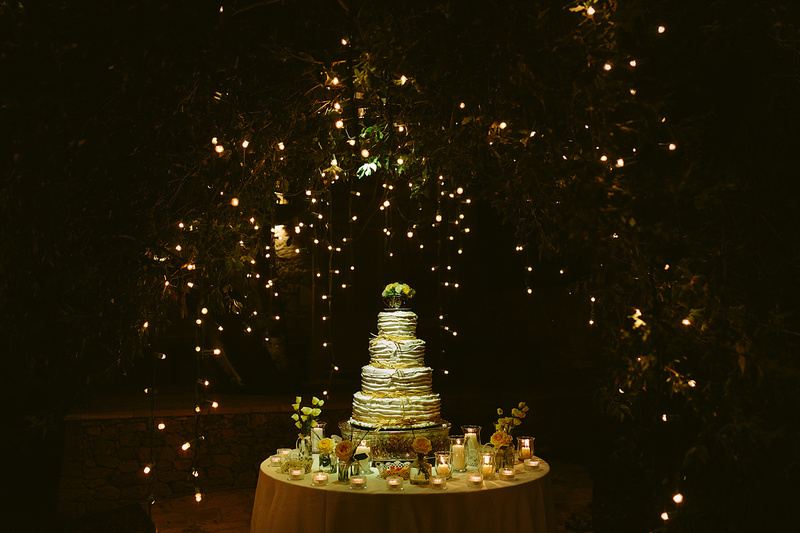 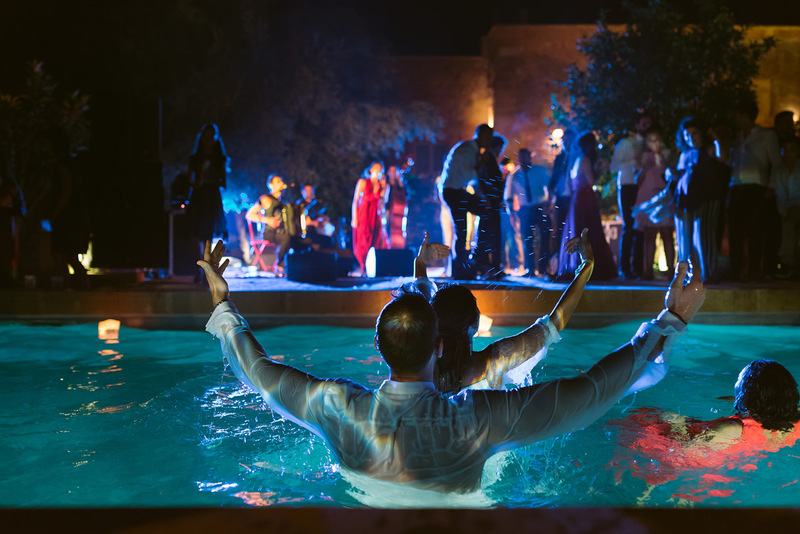 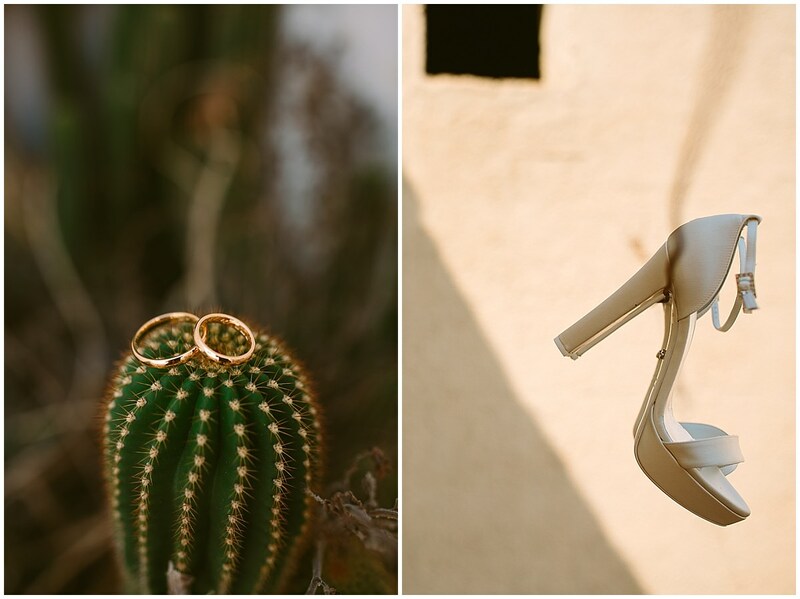 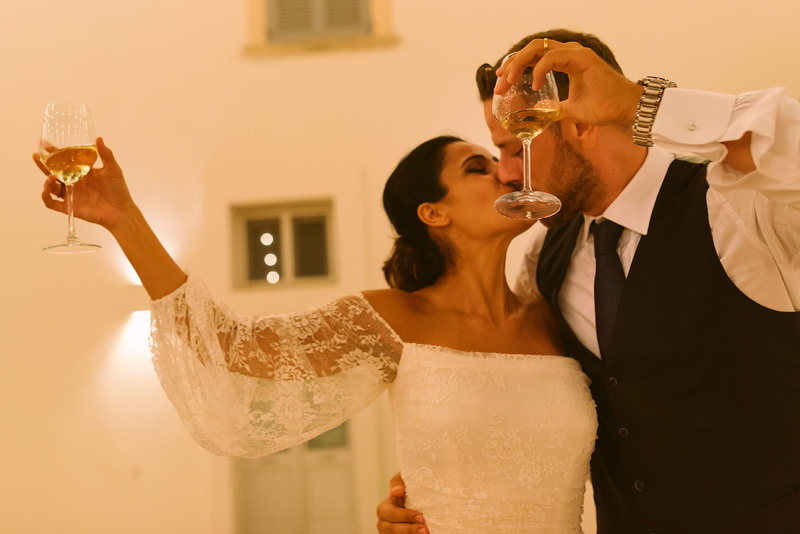 The venue was in the courtyard of Masseria Borgo Mortella, a farmhouse typical of the region and perfect as a rustic destination wedding venue in Apulia. 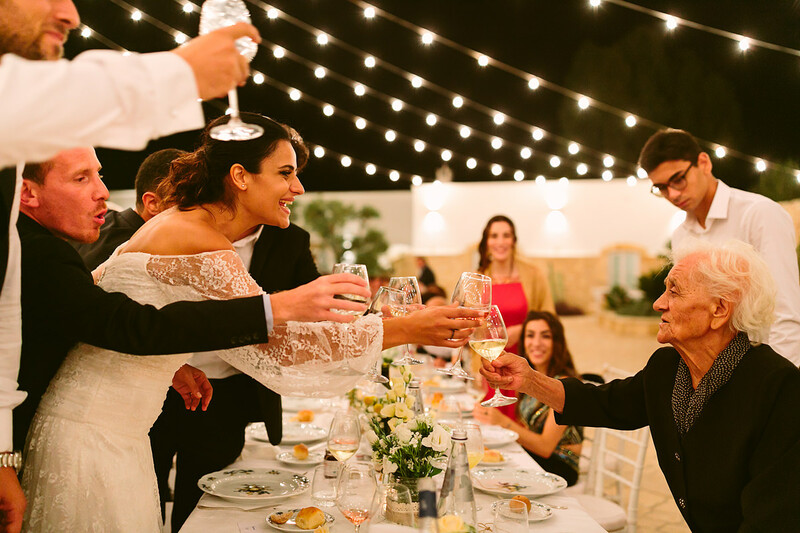 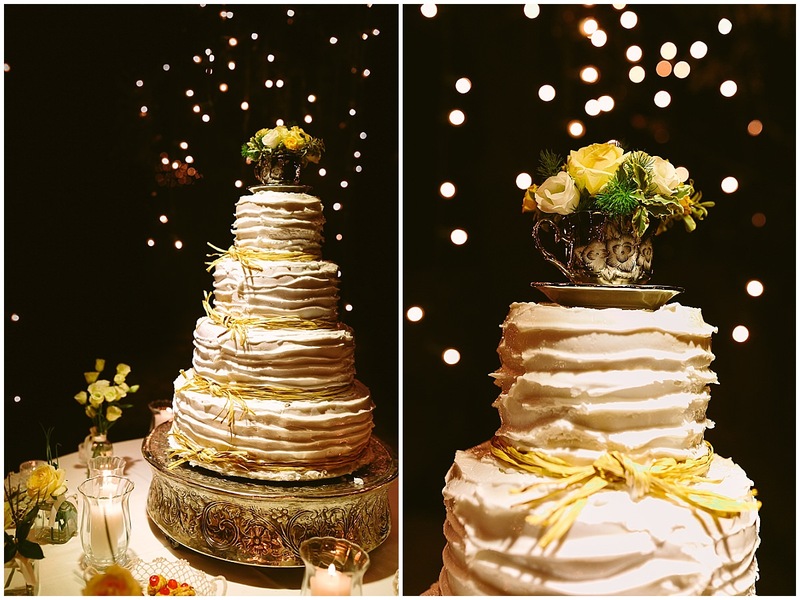 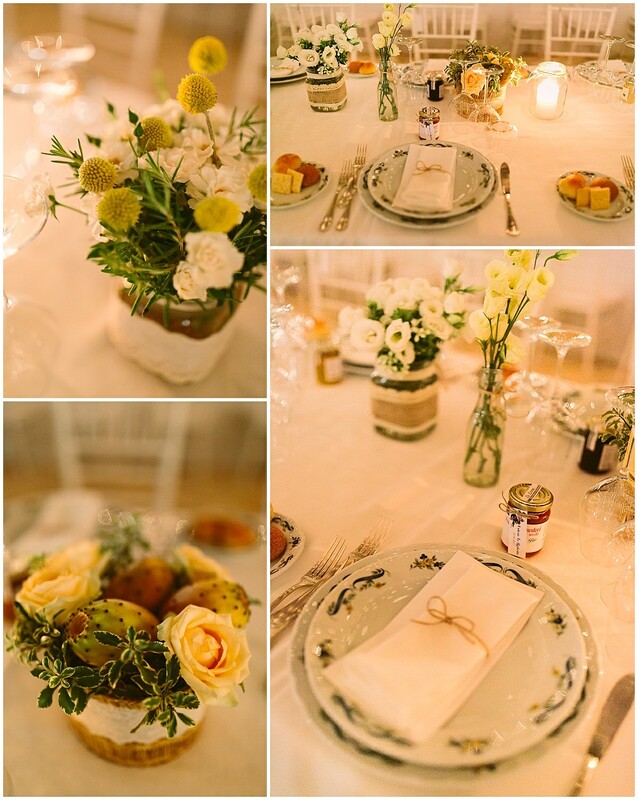 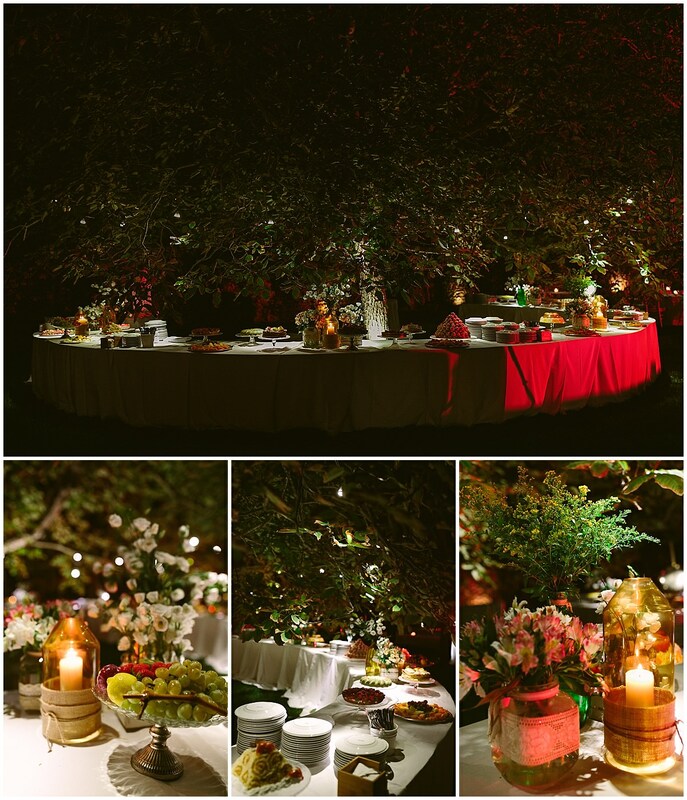 Every detail fit the theme of this Italian countryside wedding making it truly magical: the two long imperial tables, string lights, and gathered flowers in glasses and jars as centerpieces. 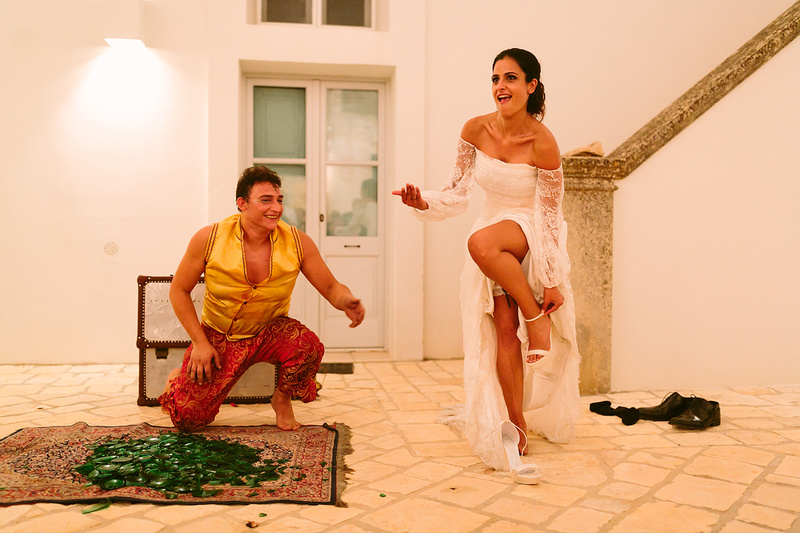 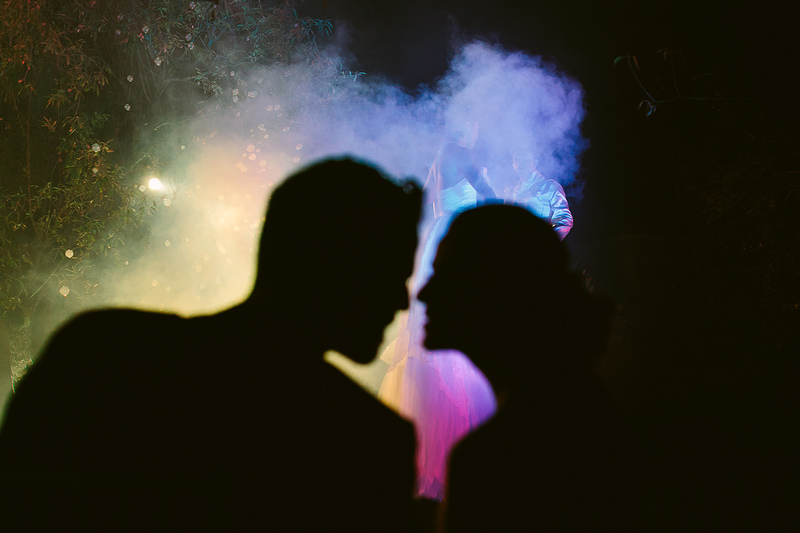 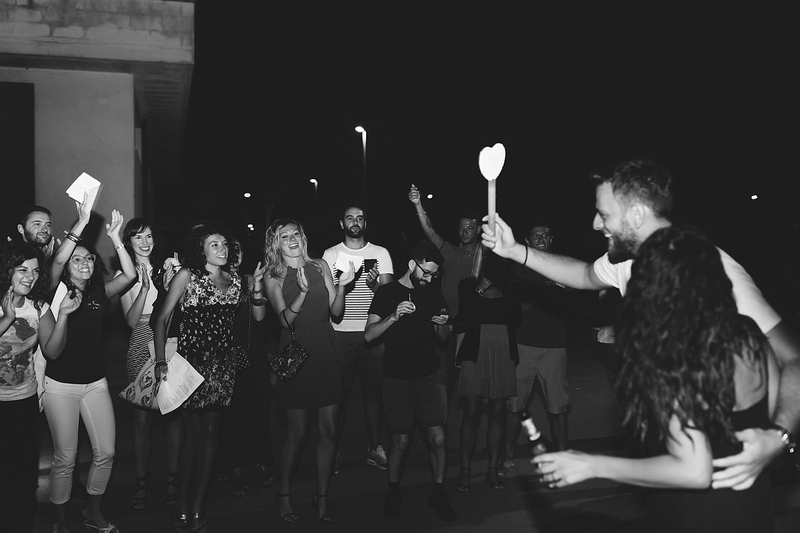 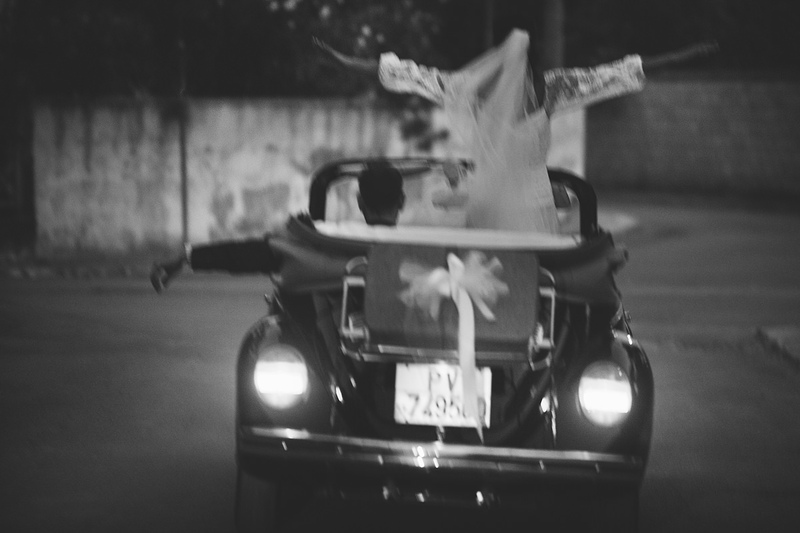 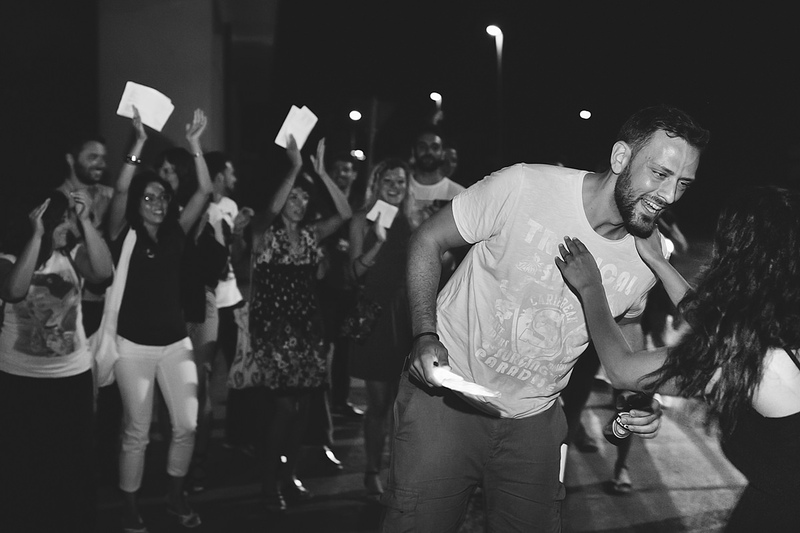 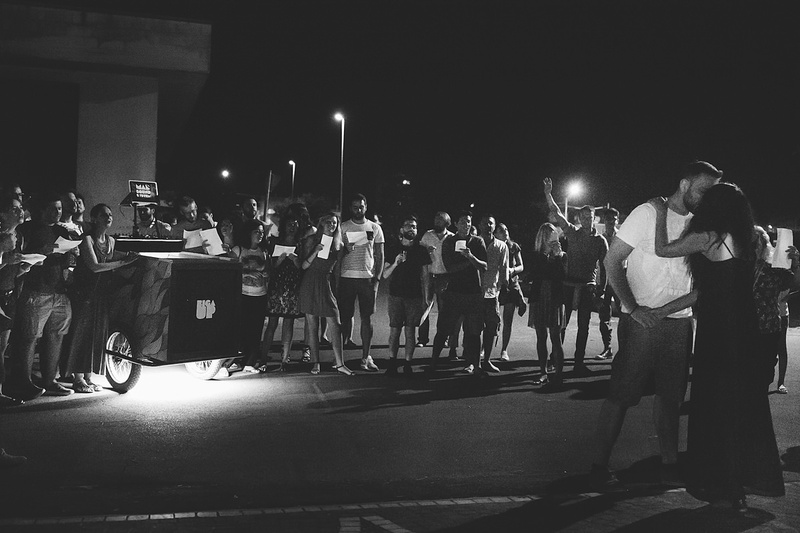 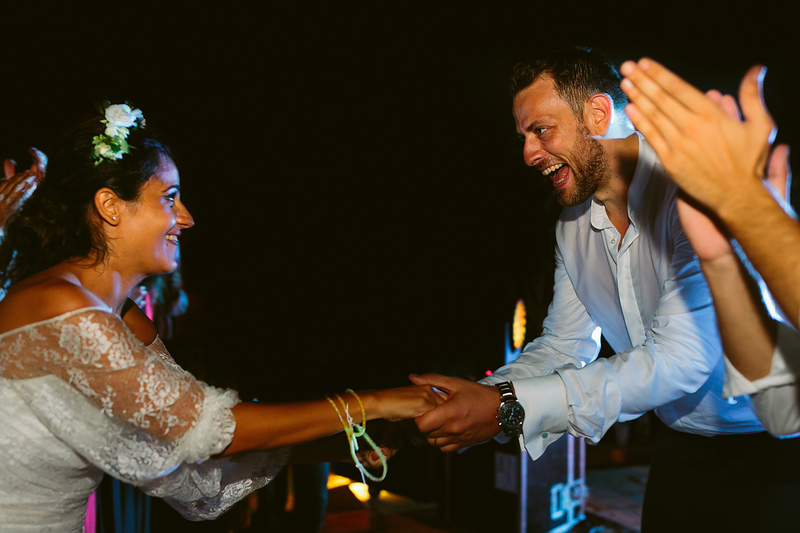 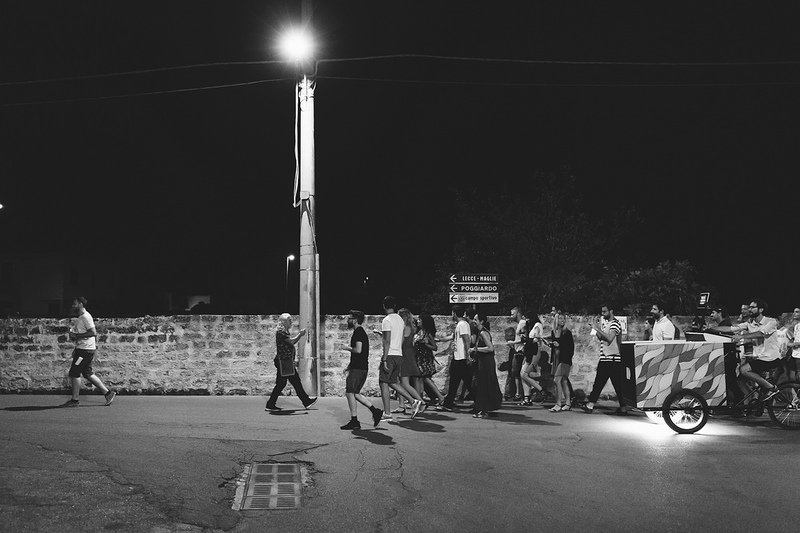 Loving Balkan folk music and street artists, they both wanted their wedding to be like a circus — and it was! 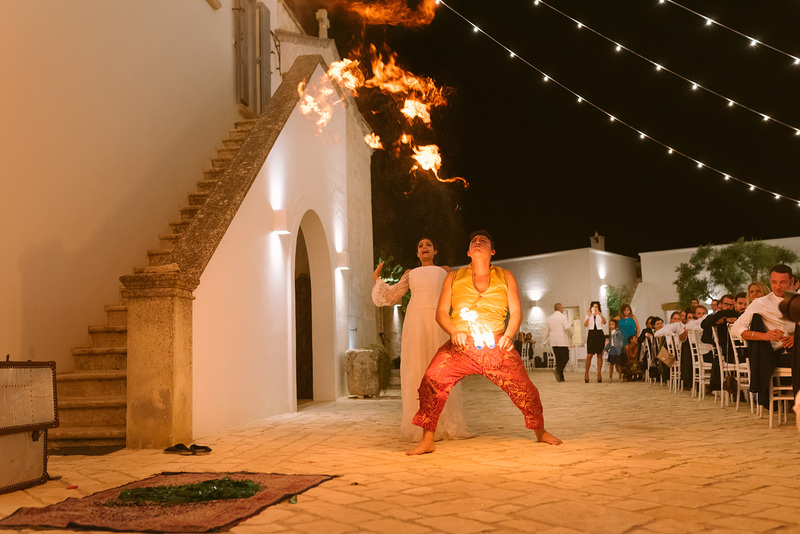 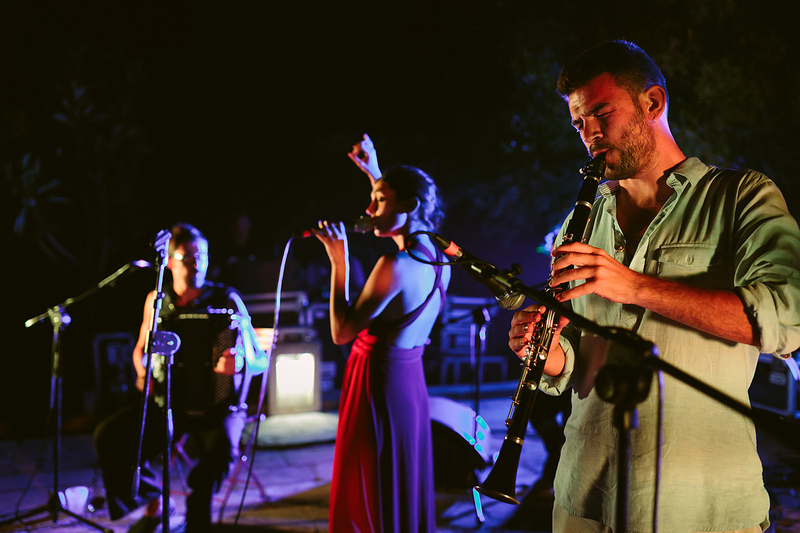 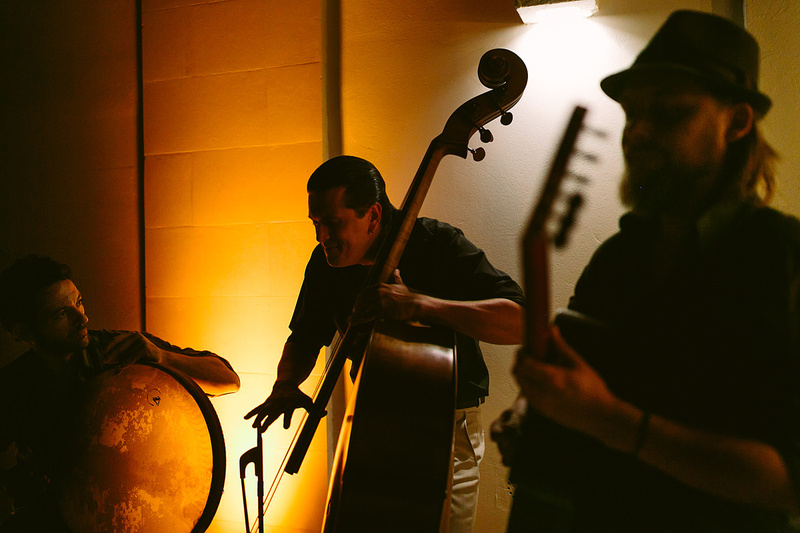 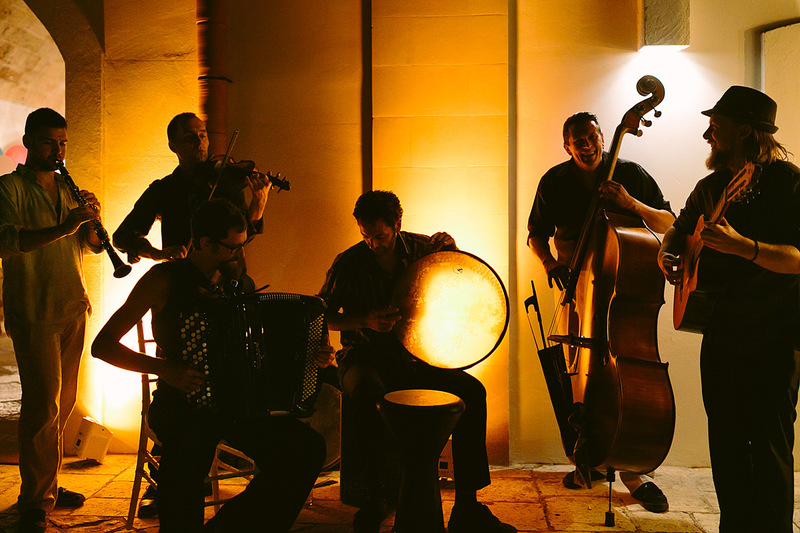 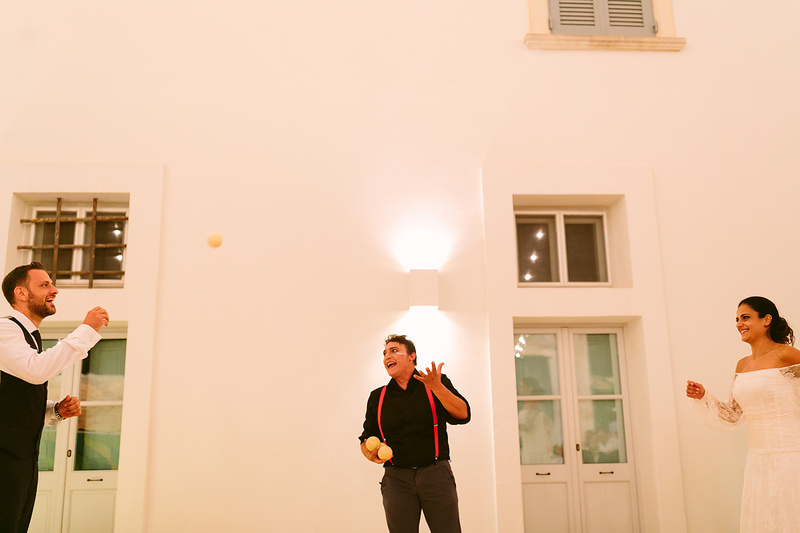 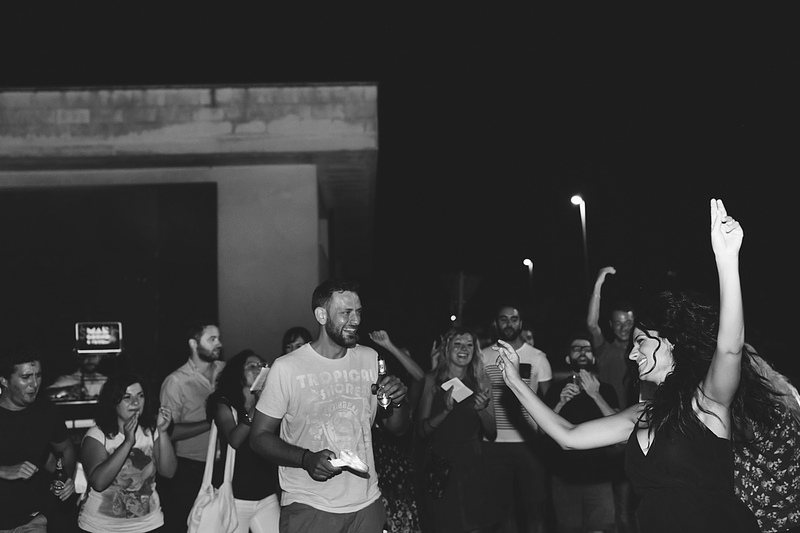 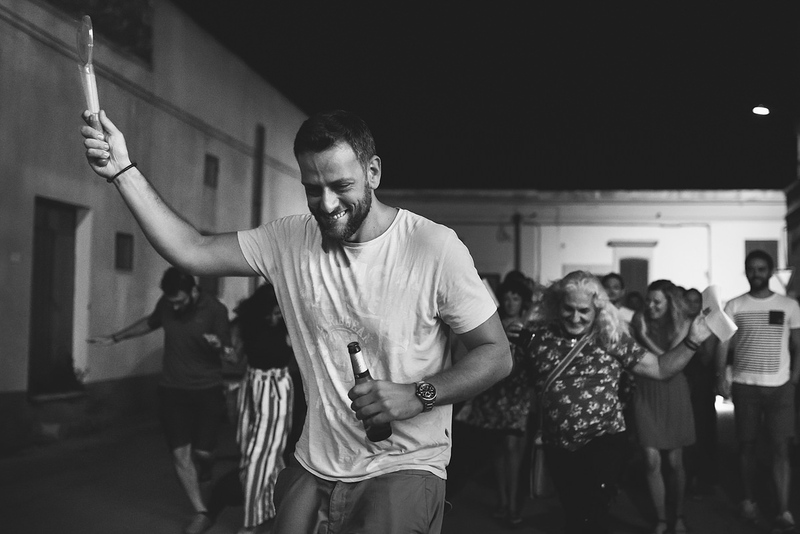 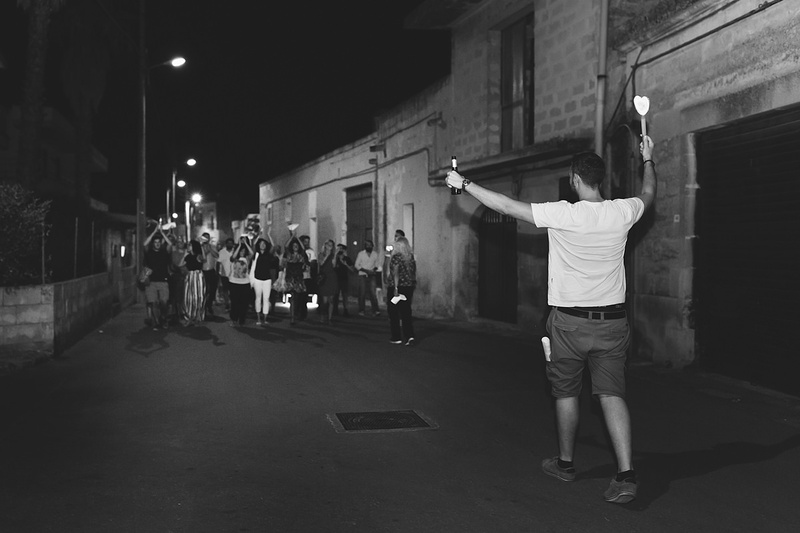 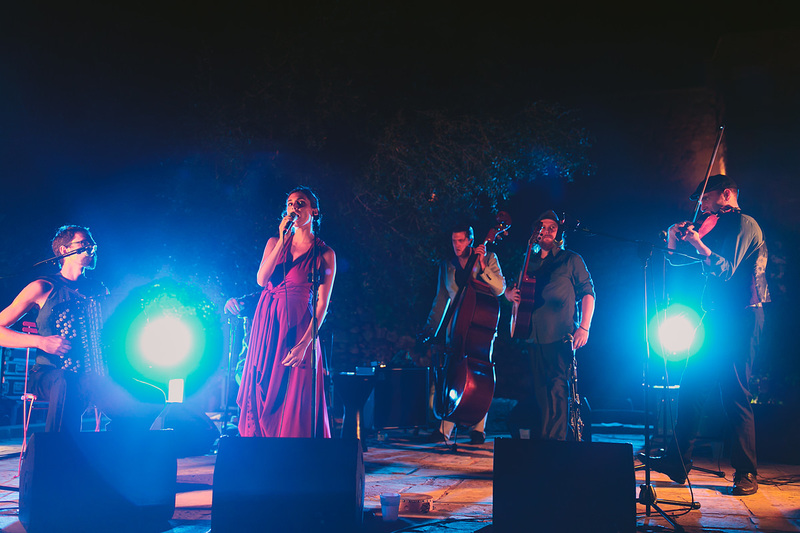 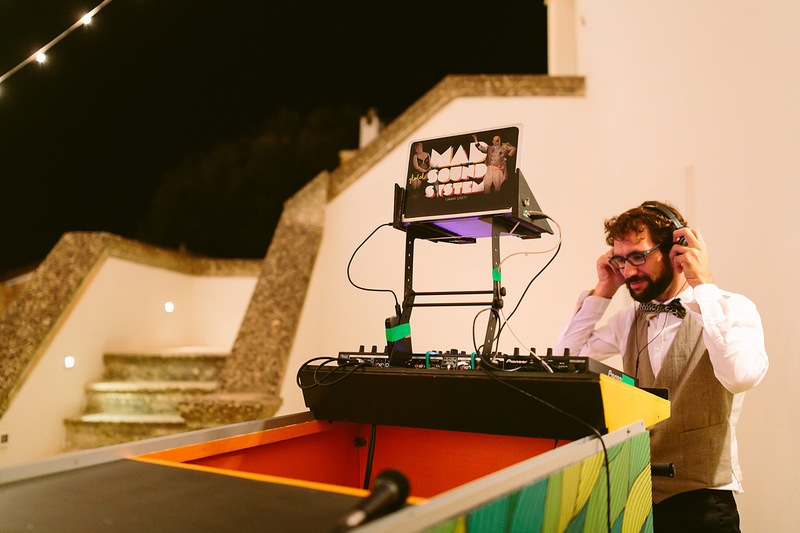 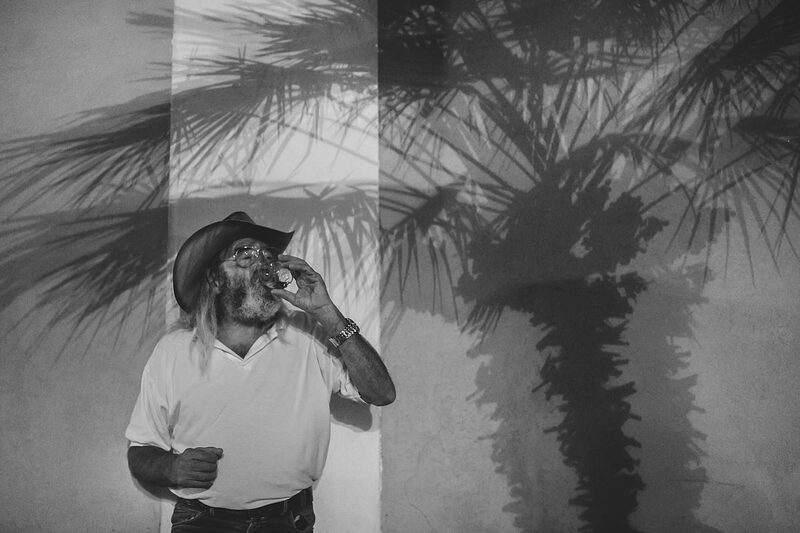 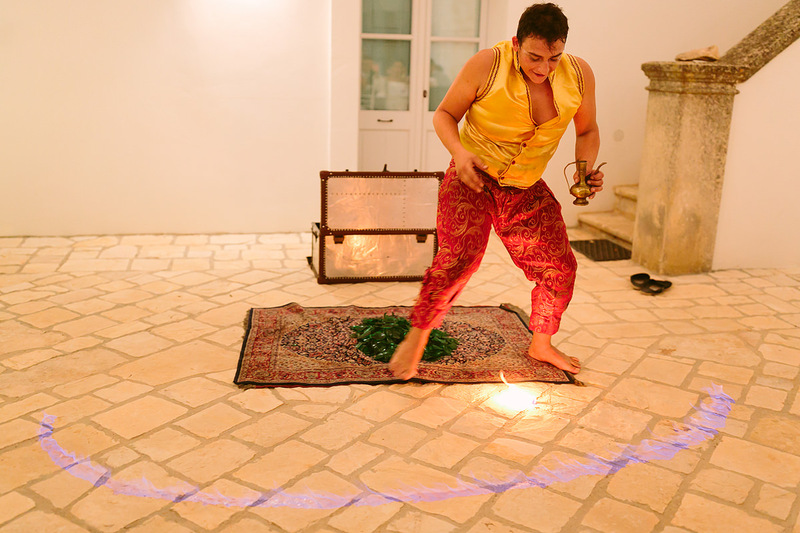 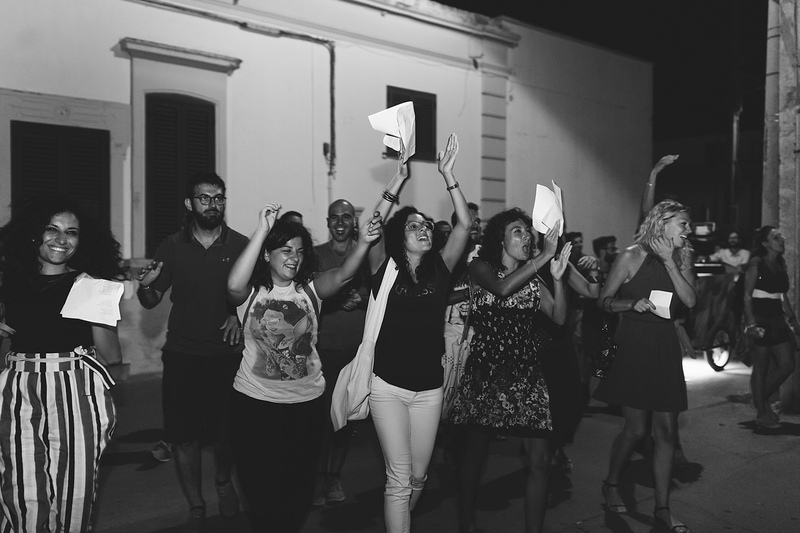 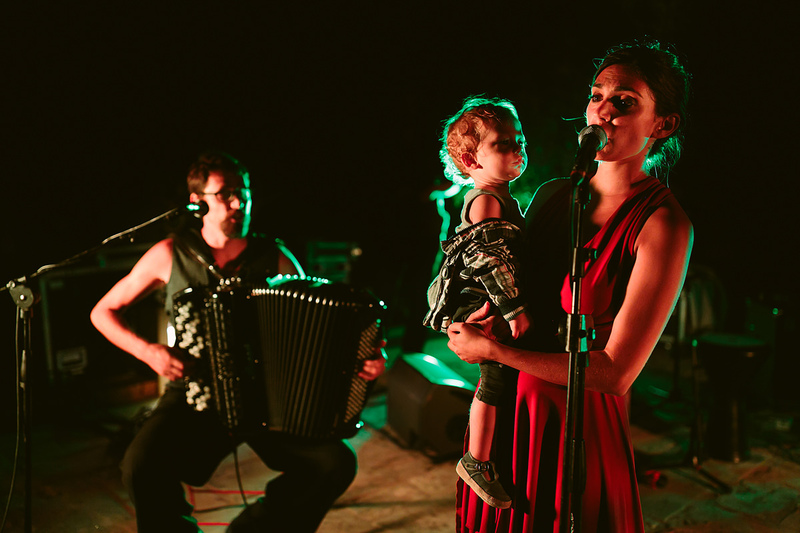 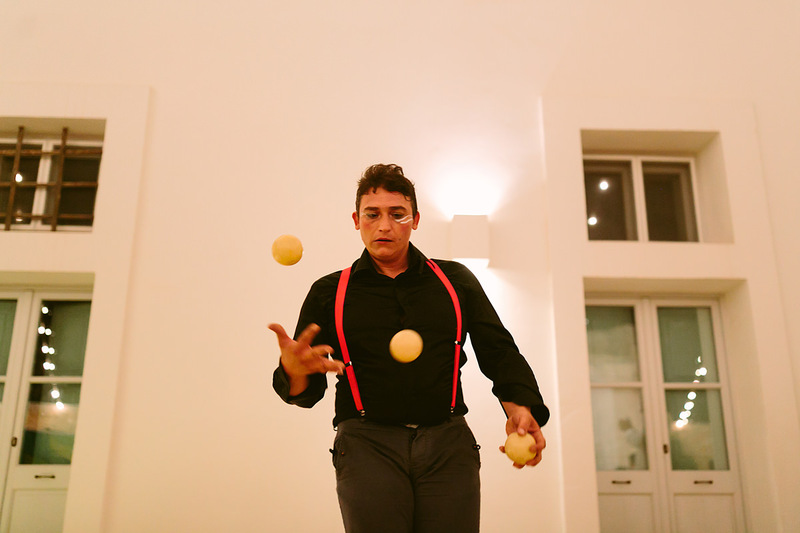 There were street artists on stilts, jugglers, fire eaters, and a famous group of Balkan musicians, the Barcelona Gipsy Balkan Orchestra who also performed for “The Night of Taranta” – Apulia’s most famous summer party! 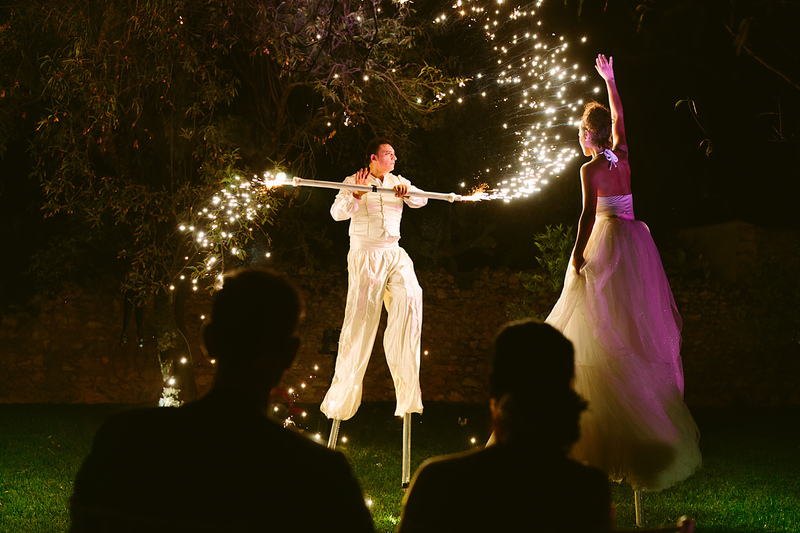 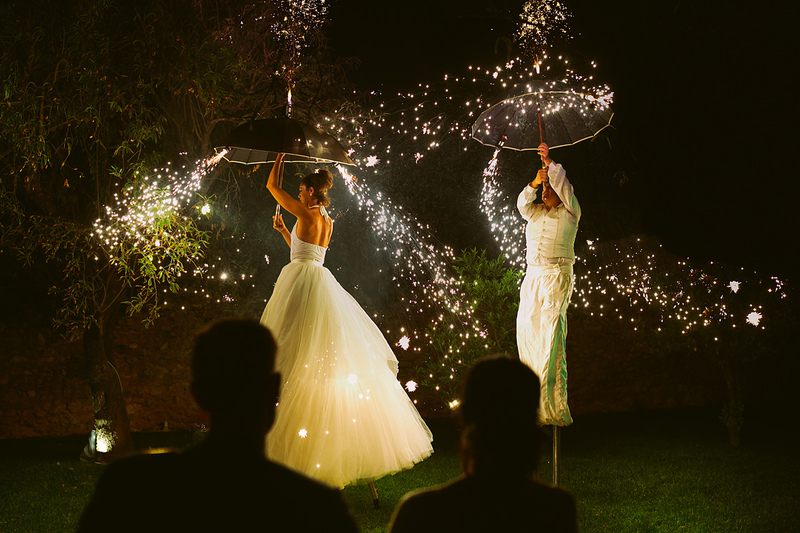 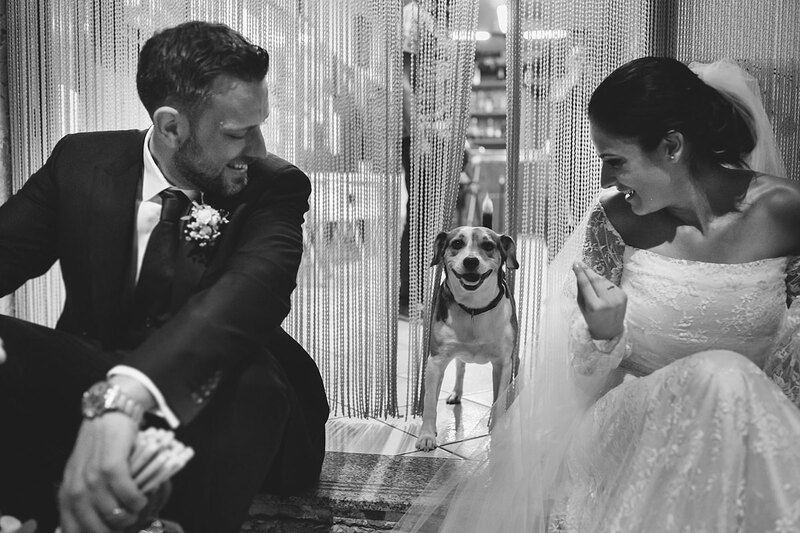 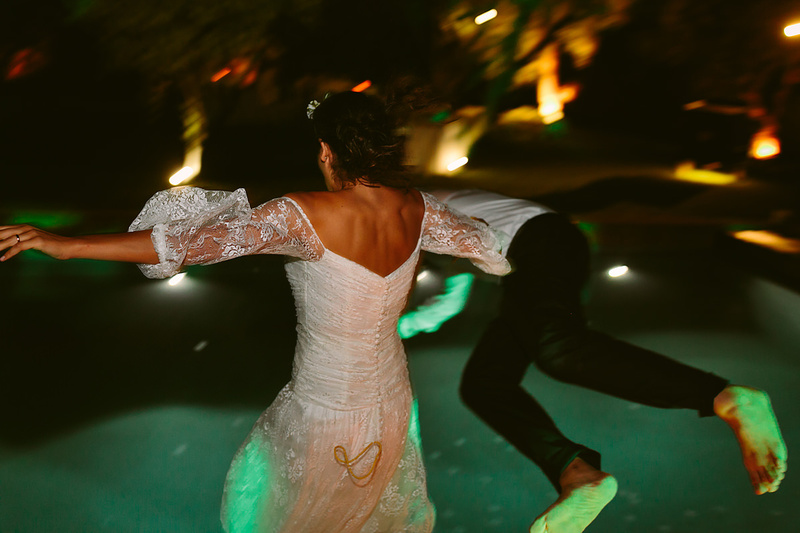 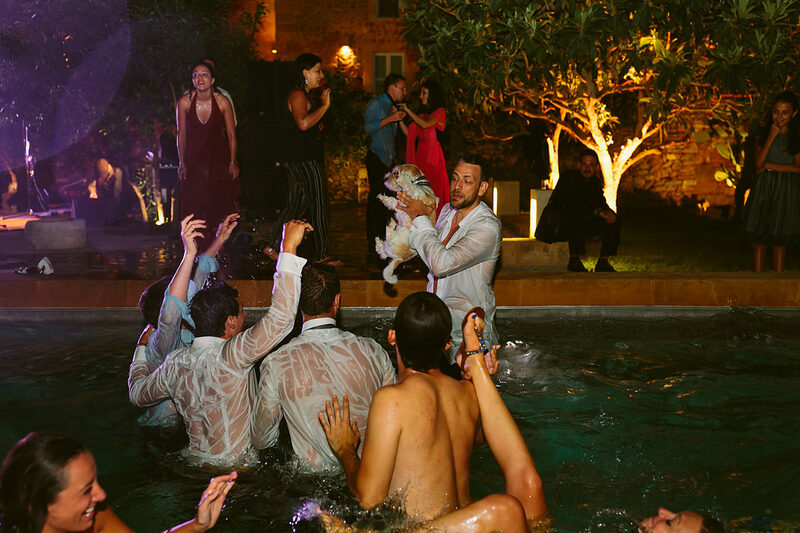 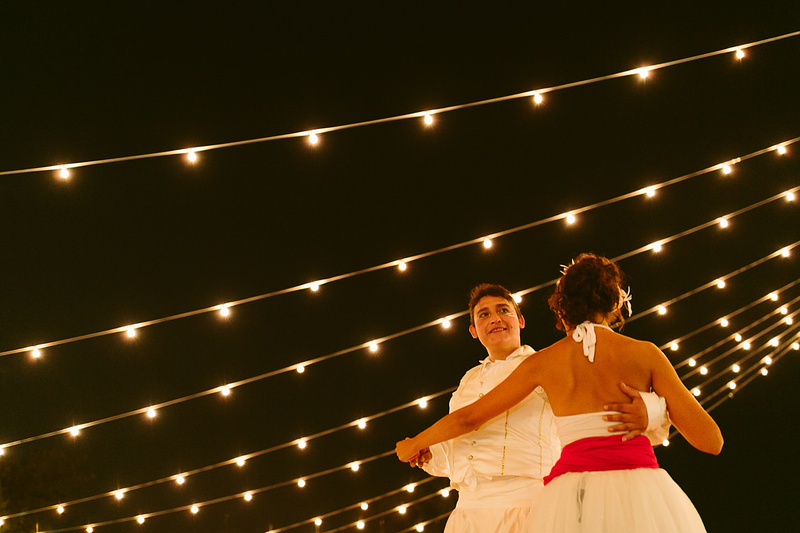 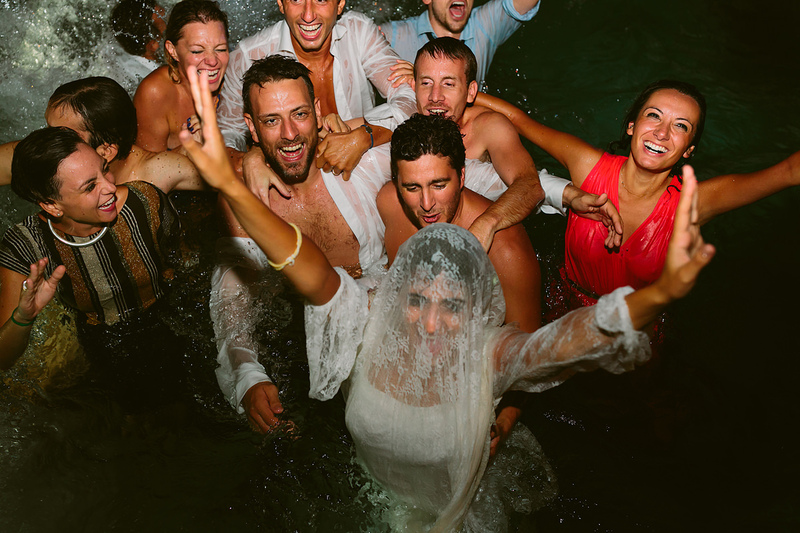 The wedding party captured the spirit of a circus — open air, smiles, joy, insanity and most of all… fun and love! 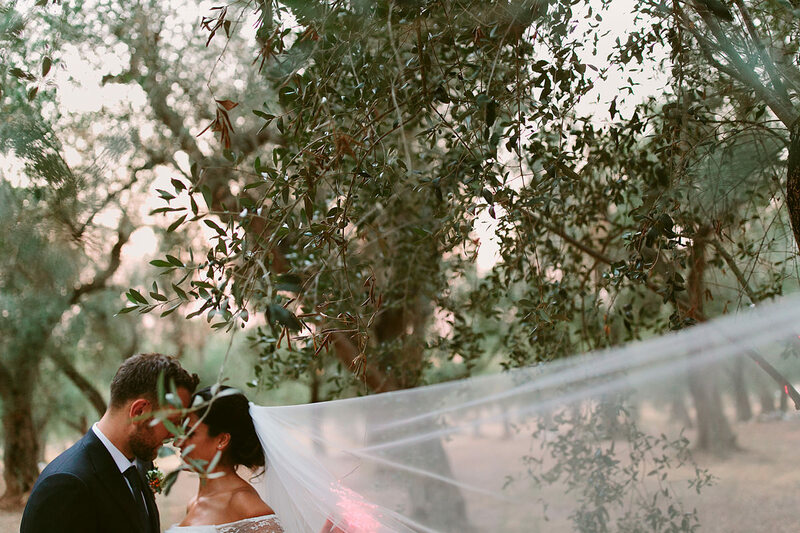 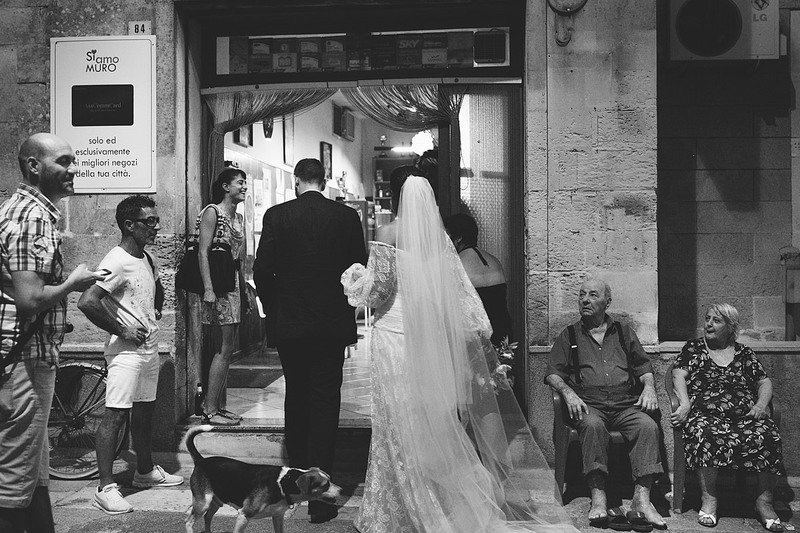 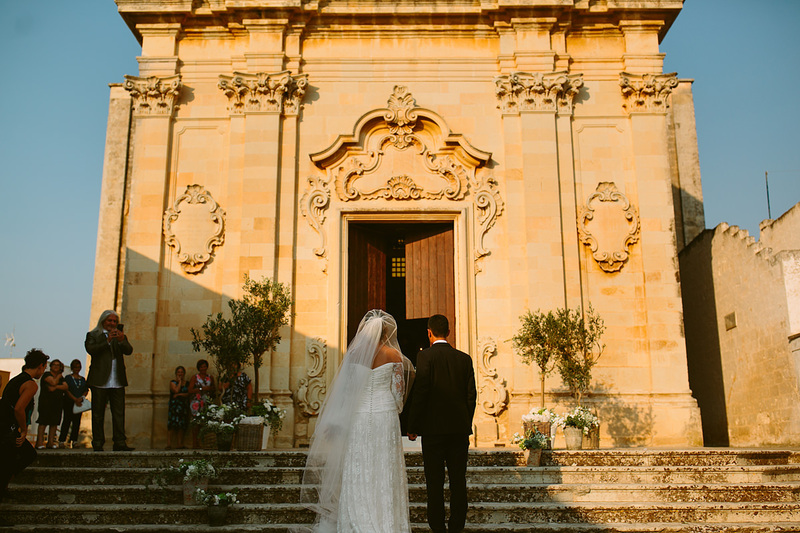 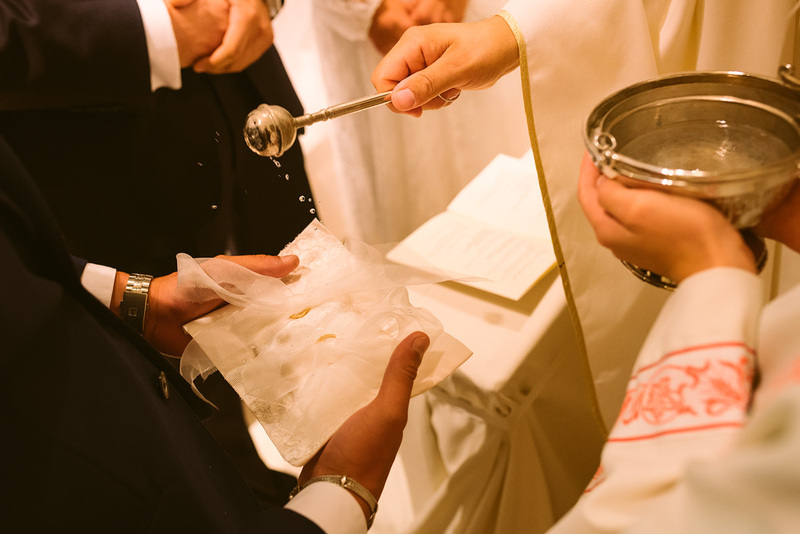 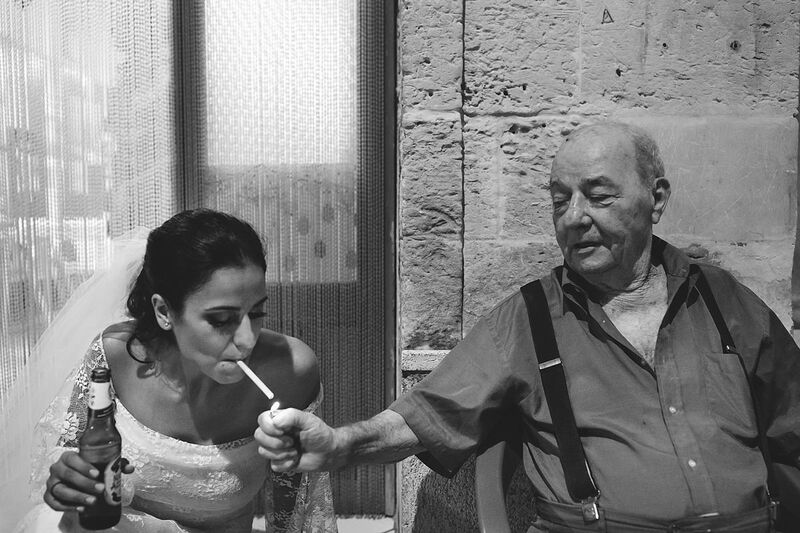 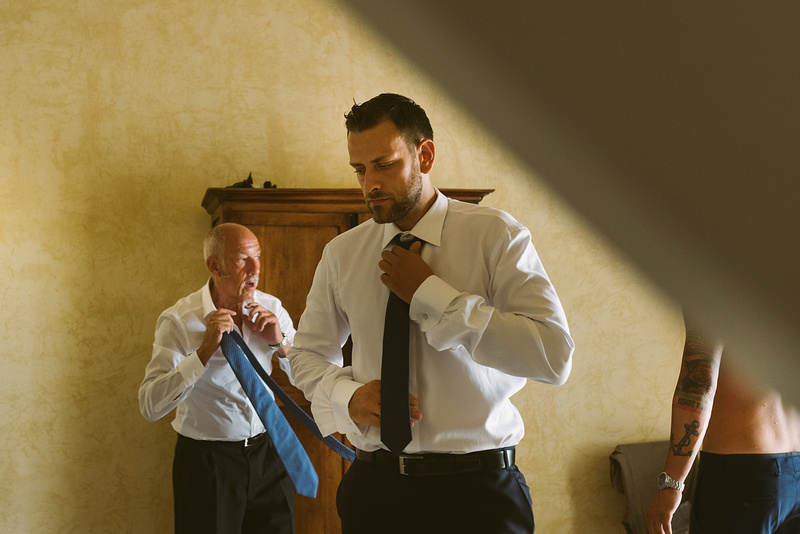 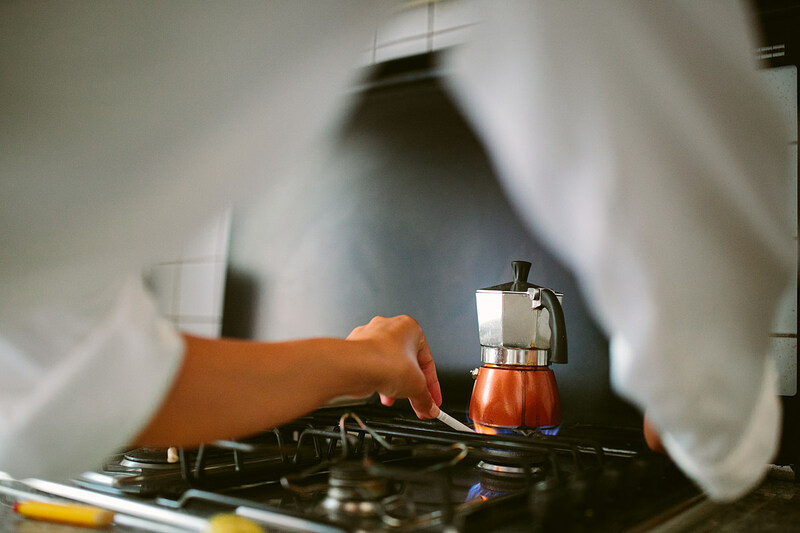 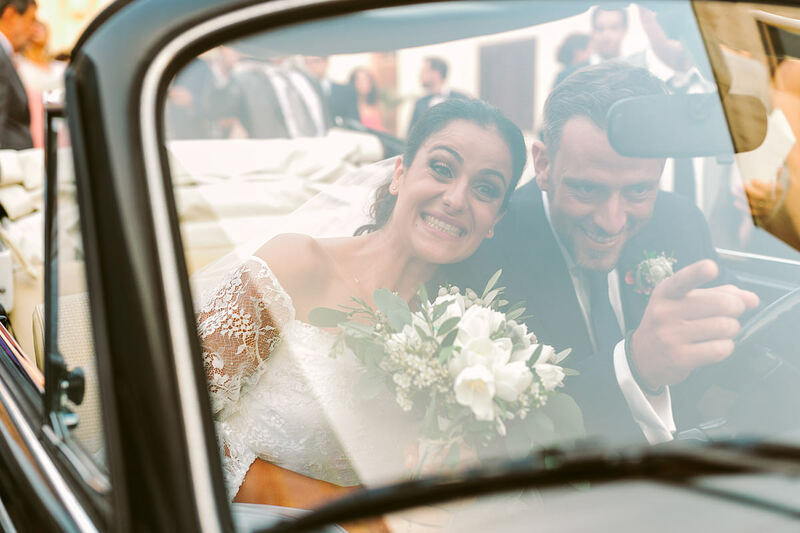 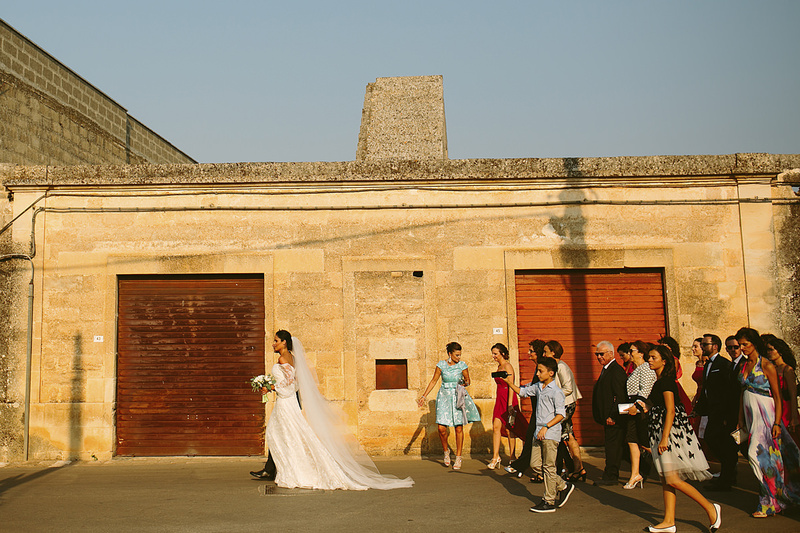 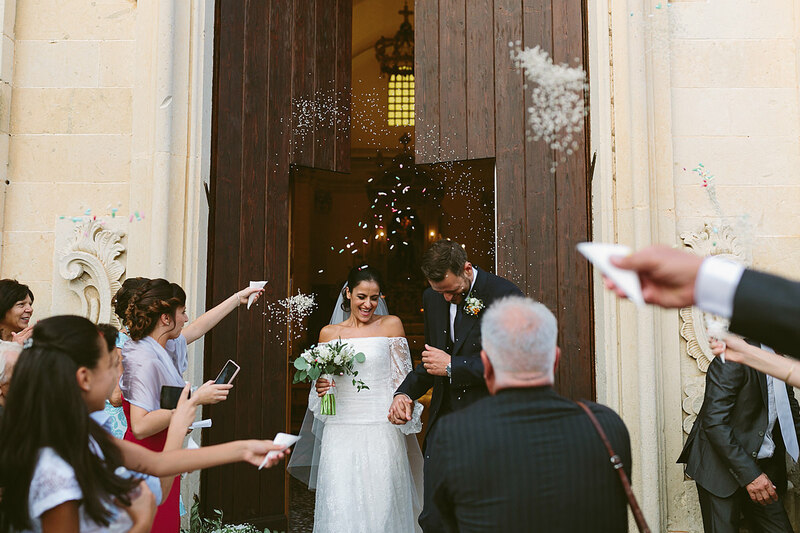 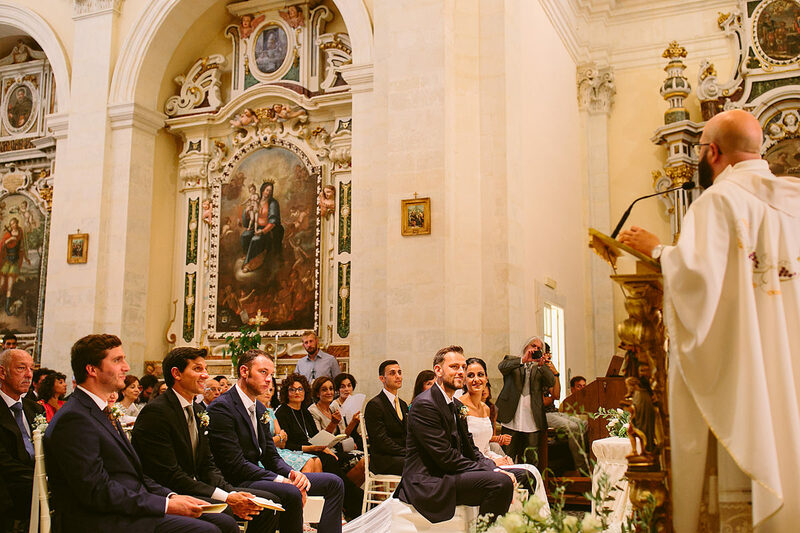 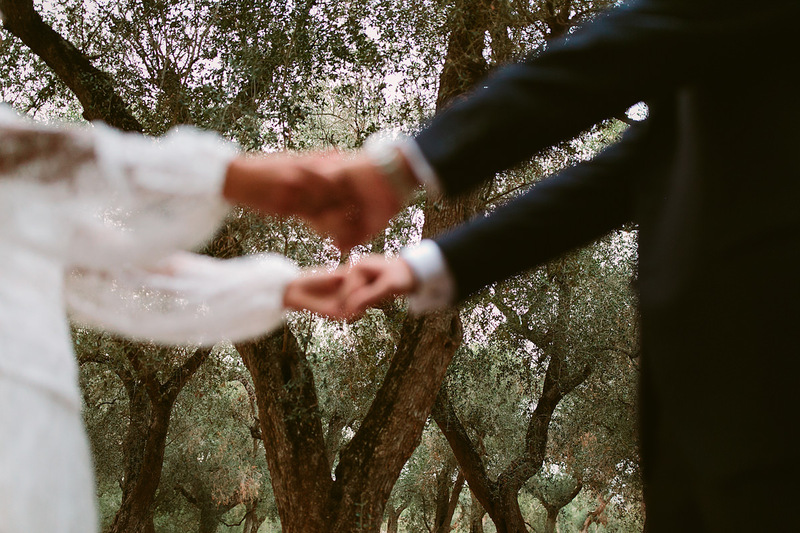 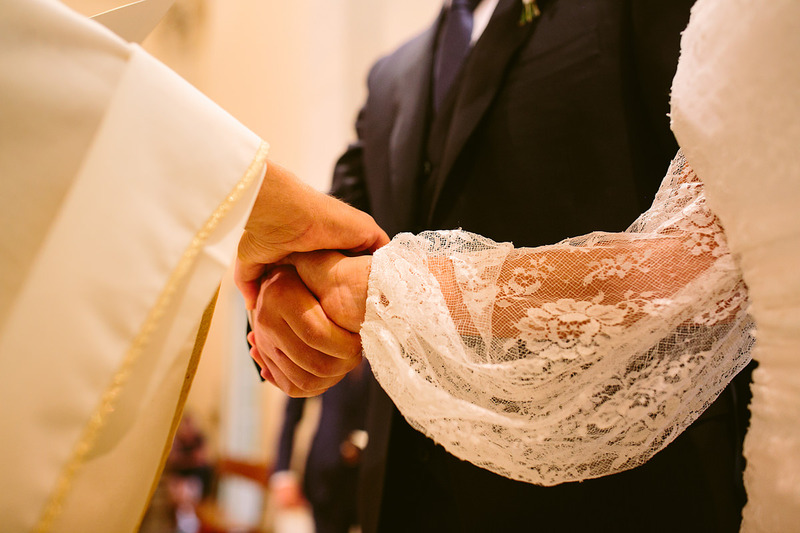 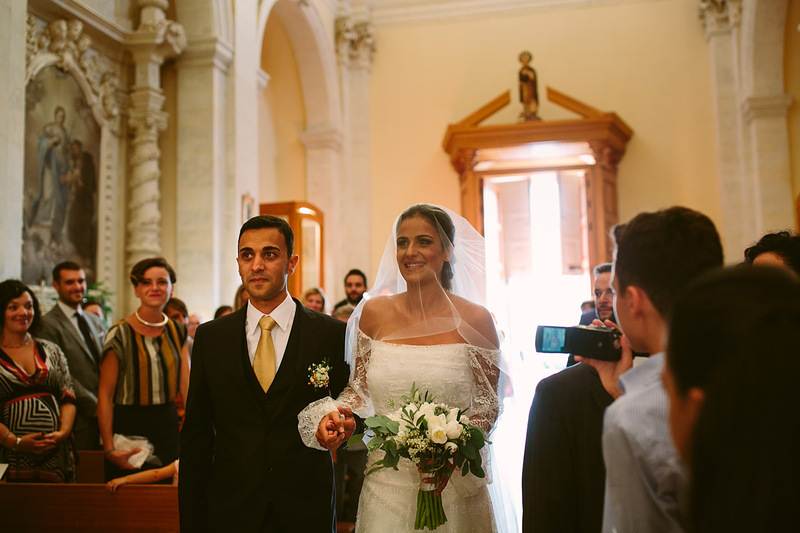 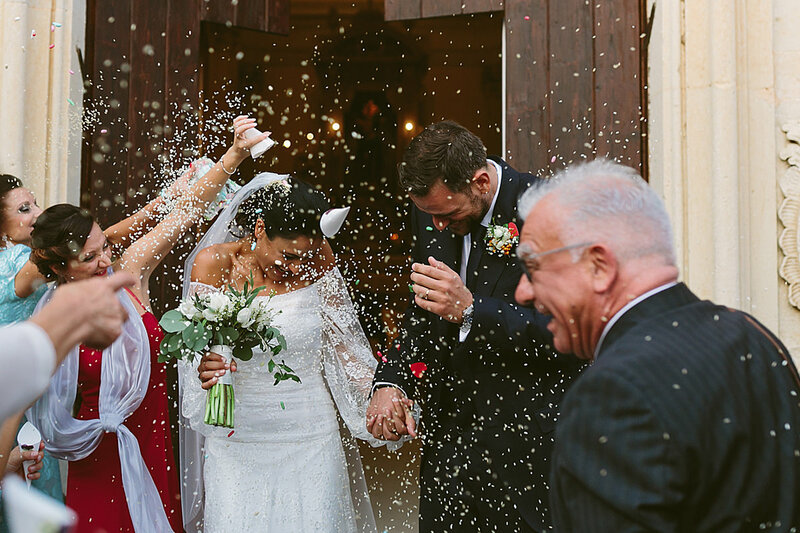 Roberta, who is from the region, and Valerio, who is from Genoa, chose Roberta’s home village of Giuggianello — a quaint little village with few residents, outside of Apulia’s Baroque Pearl, Lecce— to tie the knot. 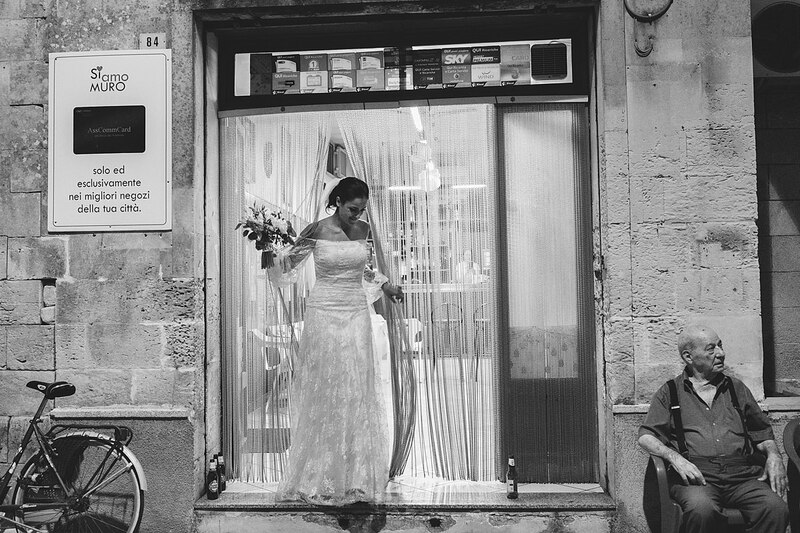 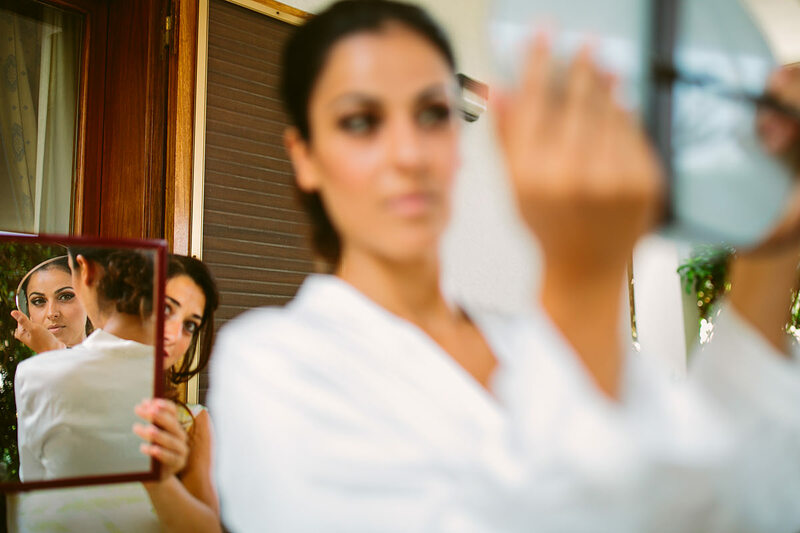 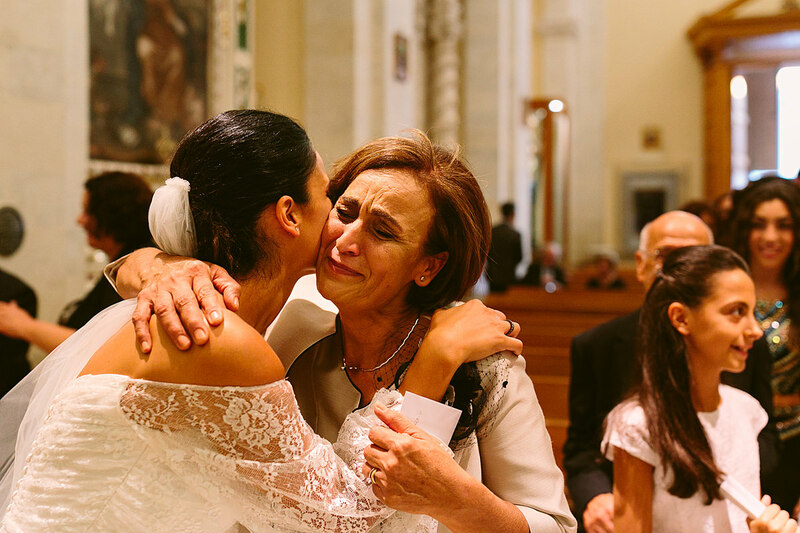 Roberta got ready in her parents’ house, and walked down to the church arm in arm with her brother. 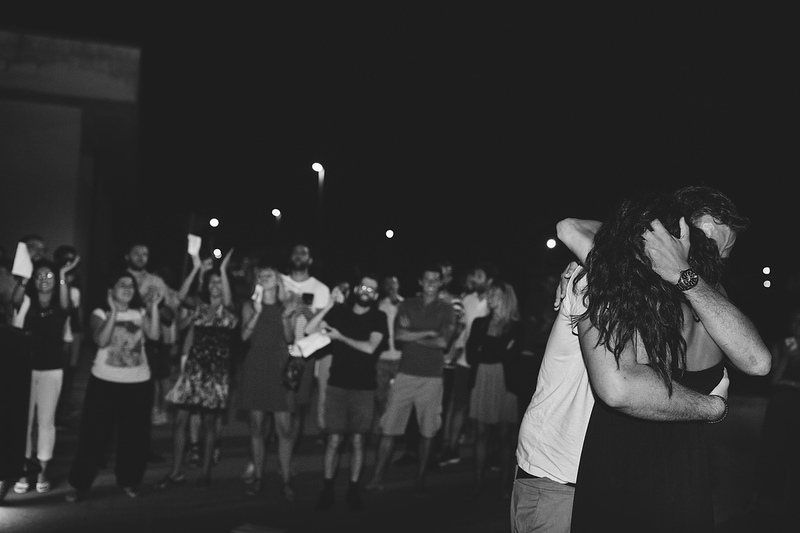 And like a parade those nearest and dearest to her followed her through the streets. 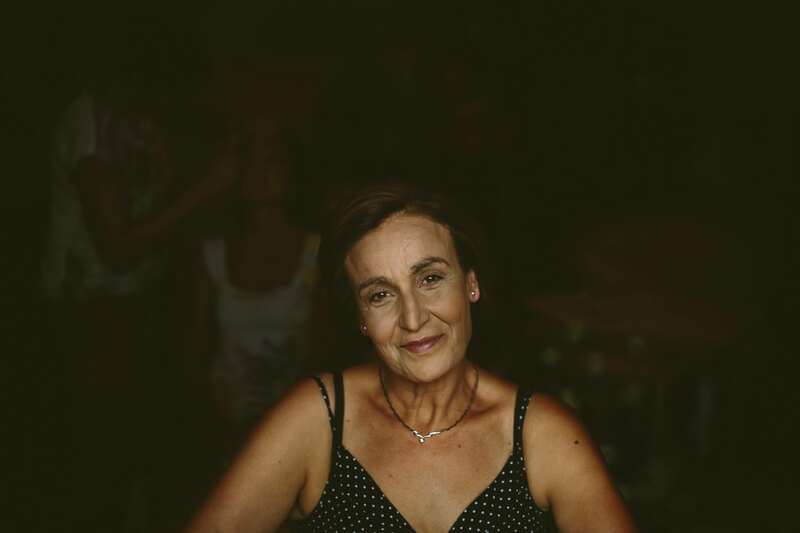 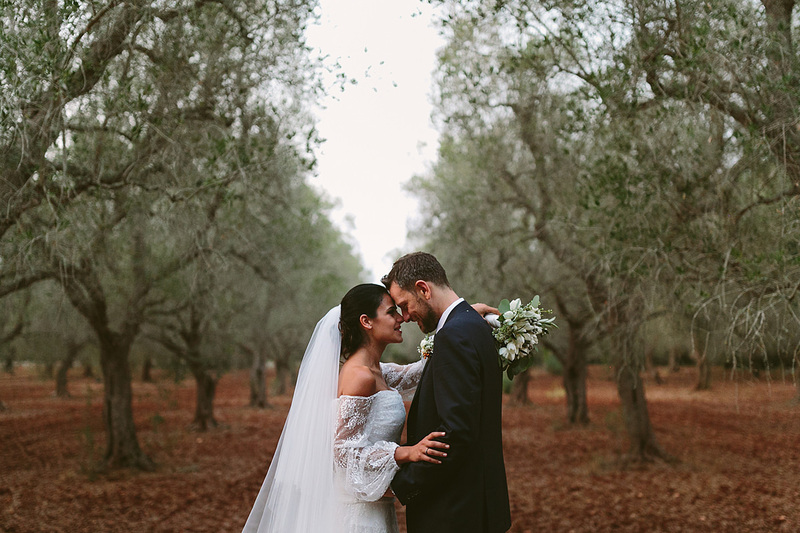 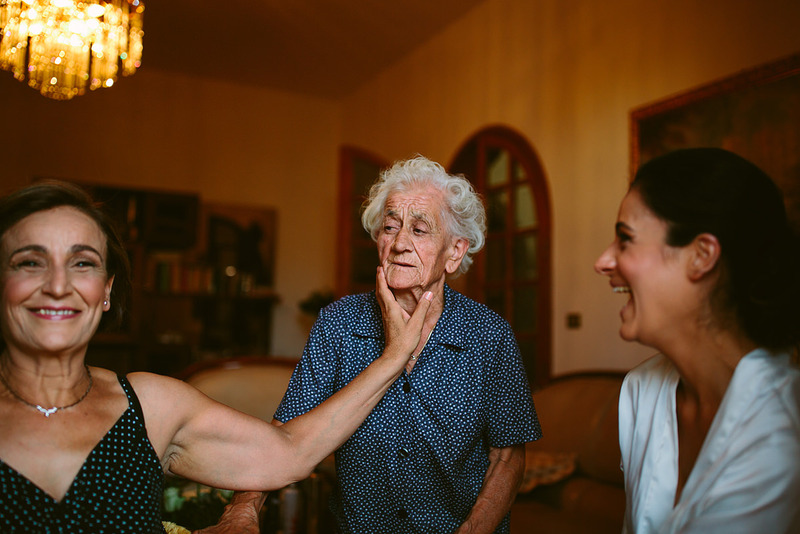 The region is famous for its olive trees and groves, and I was able to capture some stunning portraits of them in her family’s olive tree estate. 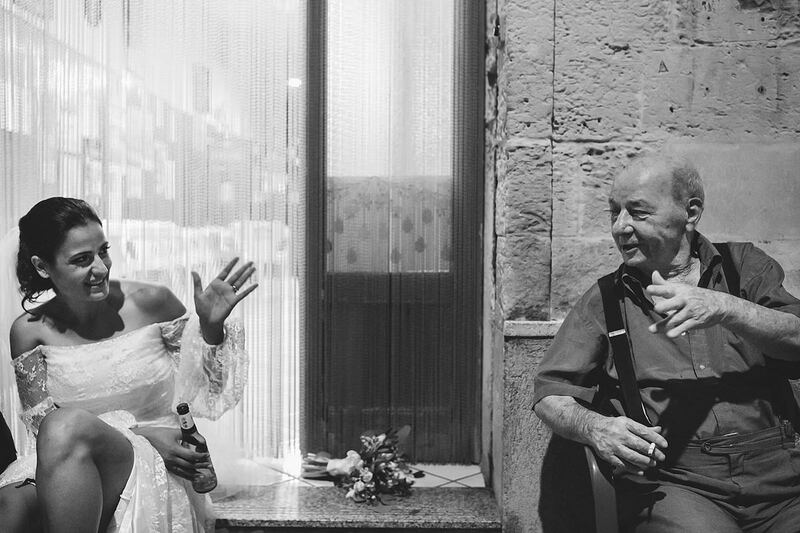 After, we stopped in a small village shop where Roberta and Valerio always go for a beer. 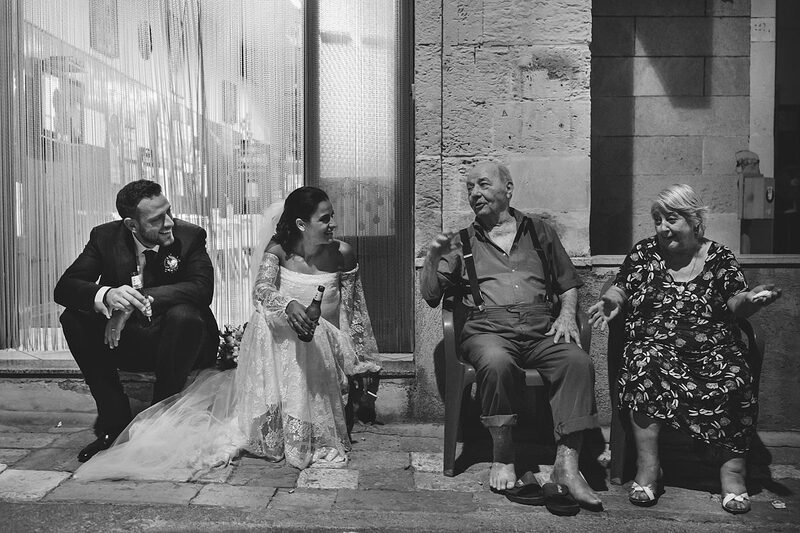 Here, in this serendipitous moment, we met Pippi and Italia, a couple married for 50 years who shared wisdom and advice in life and marriage! 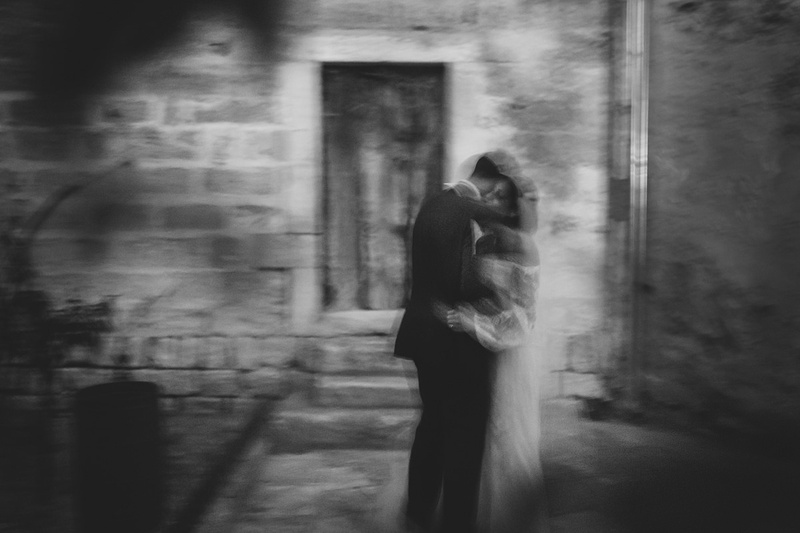 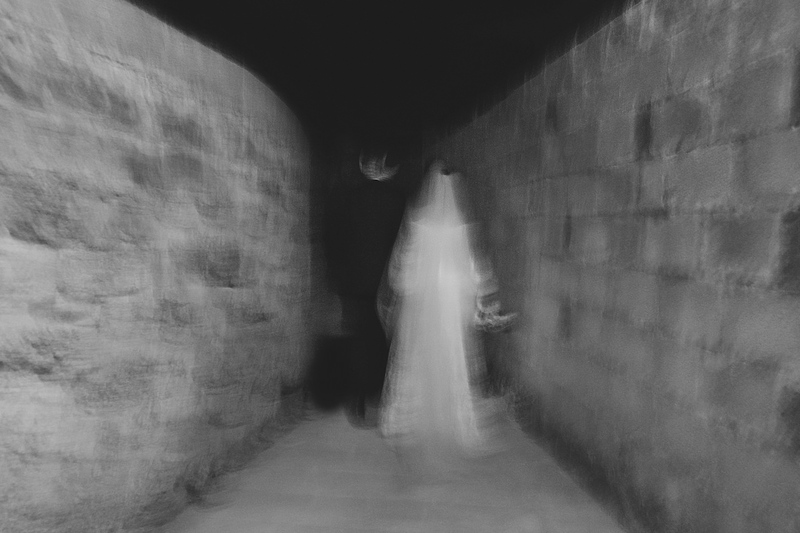 As a creative wedding photographer they suggested taking some portraits in a nearby courtyard. 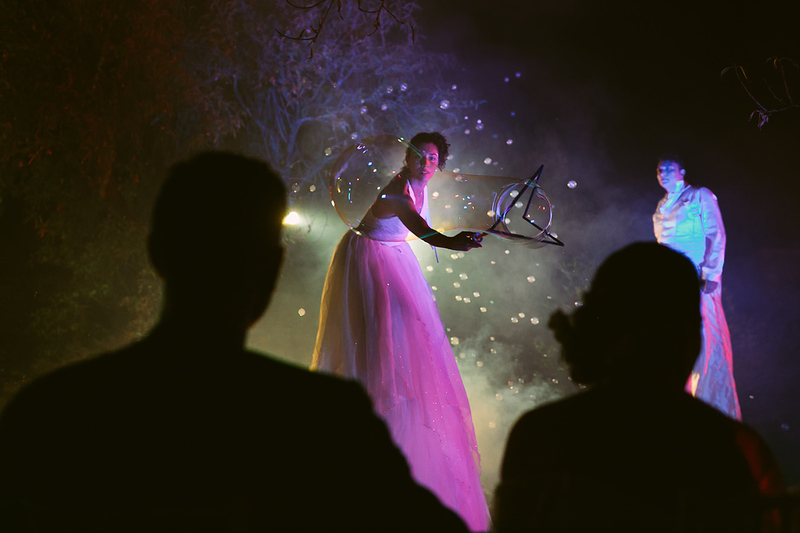 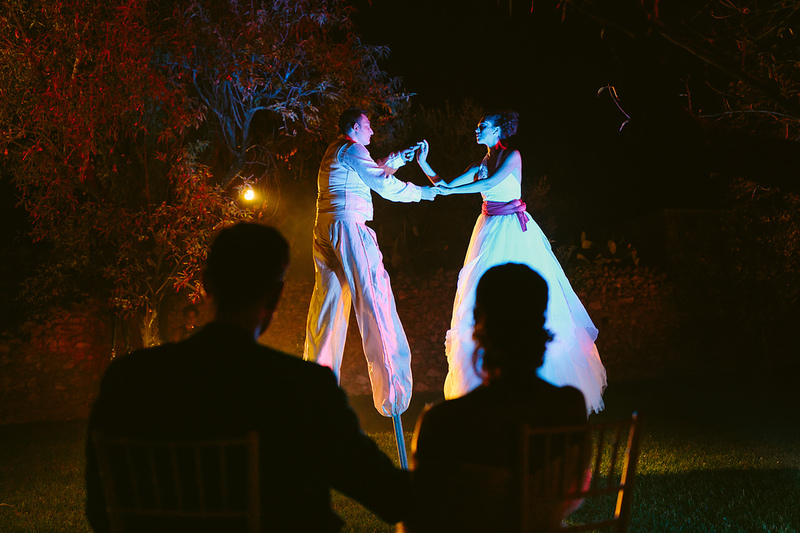 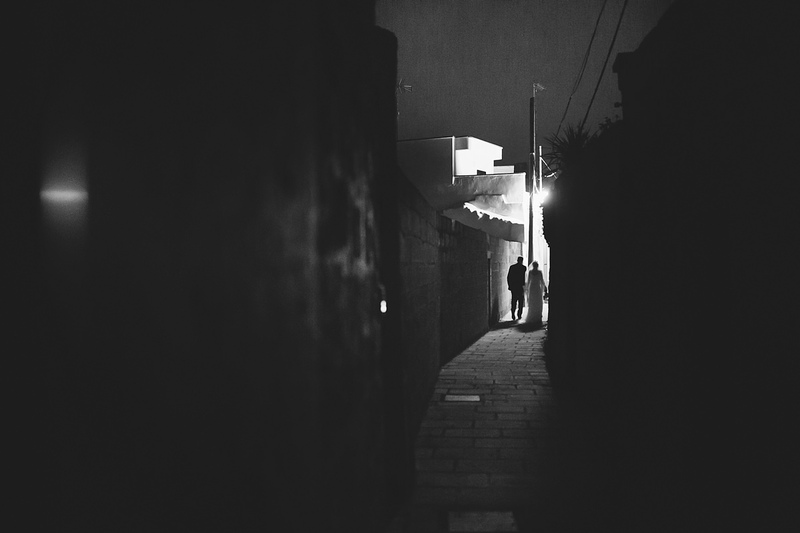 Though it was dark, magic happened in there: Roberta and Valerio began to dance, and Roberta’s singing resonated and illuminated the whole scene! 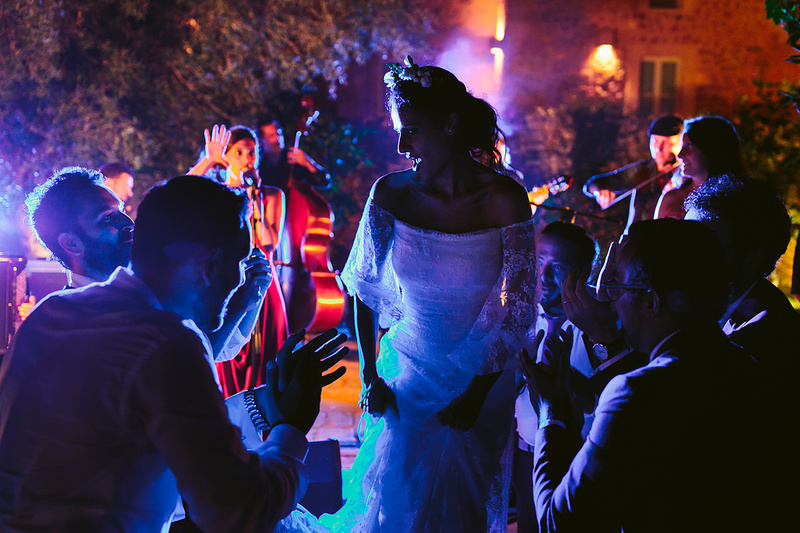 Traditionally, the night before the wedding, the groom shows up at the bride’s house (where she lives with her parents, of course) and “serenades” her with music and song, professing his love publicly for all to hear.